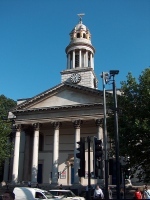 Marylebone Parish Church, or Marylebone New Church, is the church whose tower is seen from outside Baker Street Station to the left, or in an easterly direction, along Marylebone Road, a few minutes stroll past Madame Tussauds. 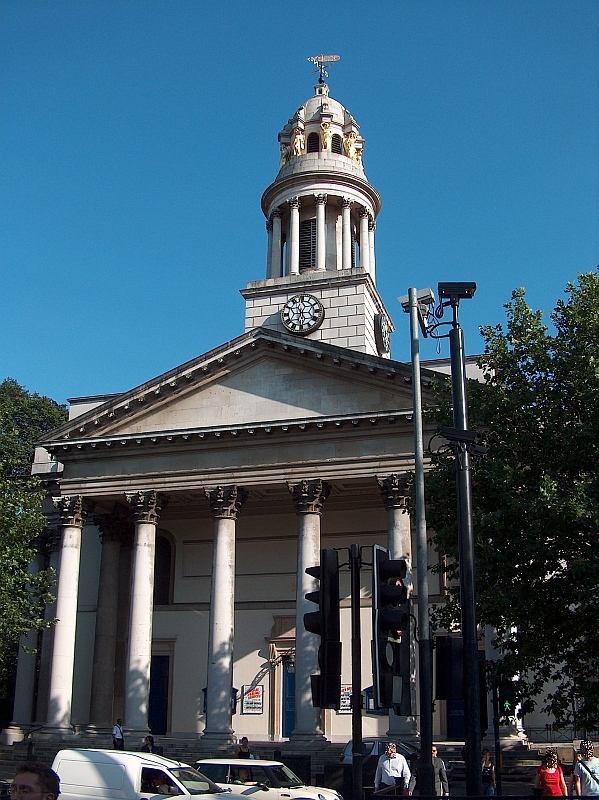 It stands facing down York Terrace, though it was the church which came first, being put up in 1813-17, the work of the architect Thomas Hardwick. Nash’s York Terrace was erected a few years later, to give the splendid vista from the northern end of the gleaming white buildings on either side of the terrace, terminated by the great ecclesiastical portico and tiered classical spire of Marylebone Church. The portico has six tall Corinthian columns topped by a blank pediment; behind this rises a solid, firmly-rooted square tower, bearing clocks on its sides; above this, a many-columned circular stage, narrowing to a higher stage, elegantly domed and bearing a prominent weathercock. 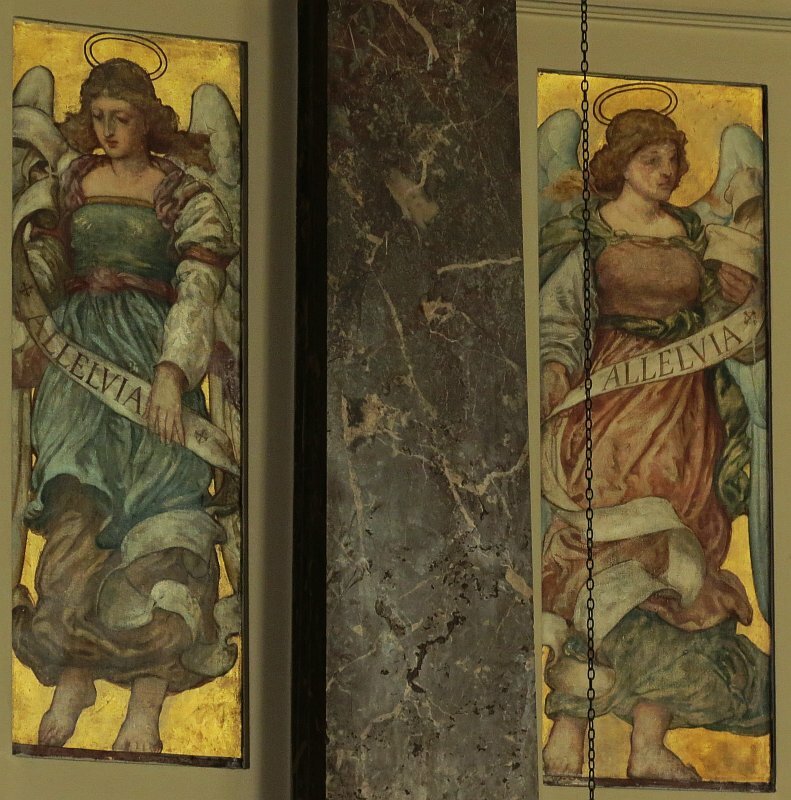 On the highest stage, notable from some distance in the sunlight, are eight gilded statues of angels acting as caryatids to the dome above – they represent the winds, and repeat each other in pairs, reflected left to right. J.C.F. Rossi was the sculptor, and according to some authors, they were made in Coade stone, though I have not been able to confirm this. 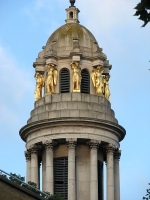 J. C. F. Rossi's caryatids on St Marylebone Church tower . Inside, the church consists of a generous, almost rectangular space, curved inwards at the altar end, to a recessed, domed apse. Galleries to either side are held on Ionic pillars, while the fluted pilasters at the apse end are Corinthian. The apse itself, and its richly painted décor, date from a late Victorian makeover of the church - see bottom of page. 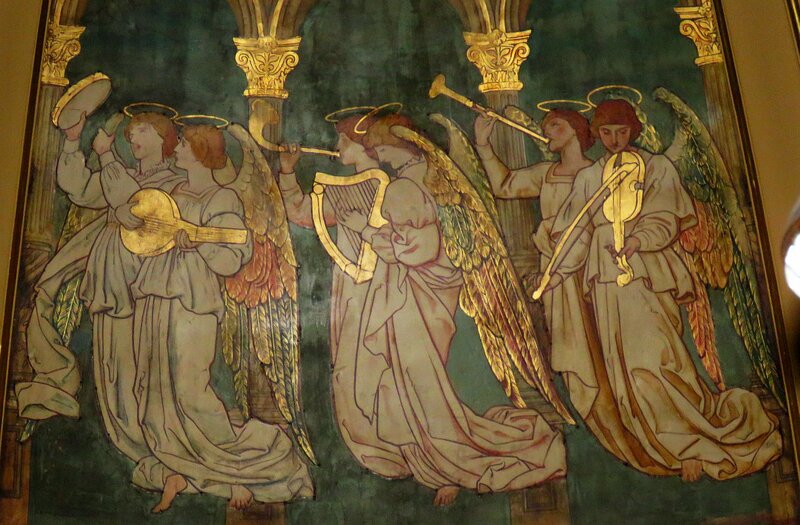 Interior of St Marylebone, and murals . And now to the primary interest of these pages, which is the large crop of monuments, around 90 in all, the large majority dating from the 1800s-1830s, with a few later ones, and a handful of earlier ones inherited from the previous church on the site. Among many simple panels are six or seven with relief figures, a portrait roundel, and a variety of pots and other minor decoration. 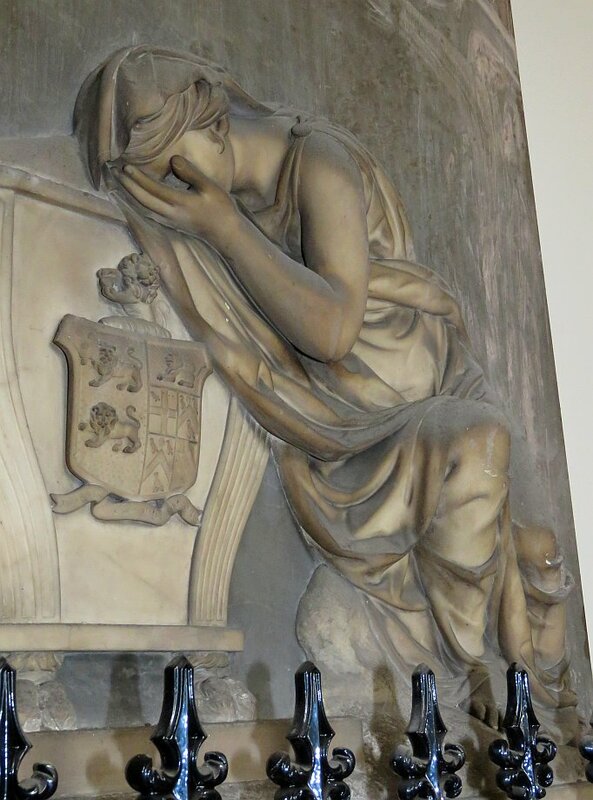 Marylebone Road used to be part of the New Road, home of many stone masons’ yards in the 1800s, and unsurprisingly a large proportion of the monumental panels in the Church are signed by their makers. There are minor works by four important sculptors: Thomas Banks, Sir Richard Westmacott RA, J.C.F. 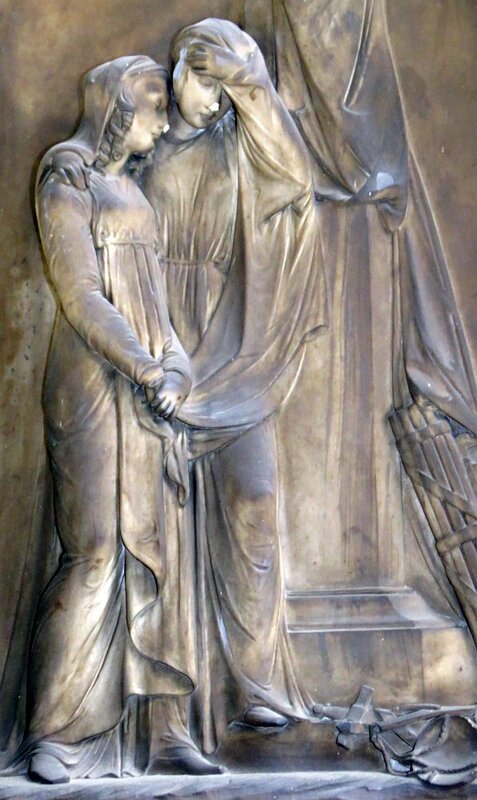 Rossi who made the caryatids for the Church tower, and John Bacon Jr, working in partnership with Samuel Manning. But it is in the lesser sculptors and craftsmen where the interest mostly lies. Humphrey Hopper has half a dozen pieces, with some small element of decorative carving; another six are by E. Physick, from a prolific family of sculptor-stonemasons of that name; five by CR or C Smith, and one by Moore and Smith; and a couple each by the estimable Peter Rouw the Younger and Knapp of Foley Street. And there are examples of work by Pistell of New Road, Marsh of New Road, Randall of New Road, Whitelaw of New Road, C. Thompson of Osnaburgh Street, C. King of Tottenham Court Road, Denman of Regent Street and Gaffin, likewise, Stothard of Upper Seymour Street, Whitehead of Fitzroy Square, Sievier, William Behnes, and more. Sir Edmund Dowce of Broughton, d.1644 . The most ancient monument in the Church, to my knowledge, taken from the old church. Monuments at this time had the inscription on a black panel, with a typically alabaster Classical surround. This one is typical of the type: there is an inner frame, and receding outer pilasters, Corinthian, with extra decorative elements, in this case winged cherub heads (see this page for lots of such things). 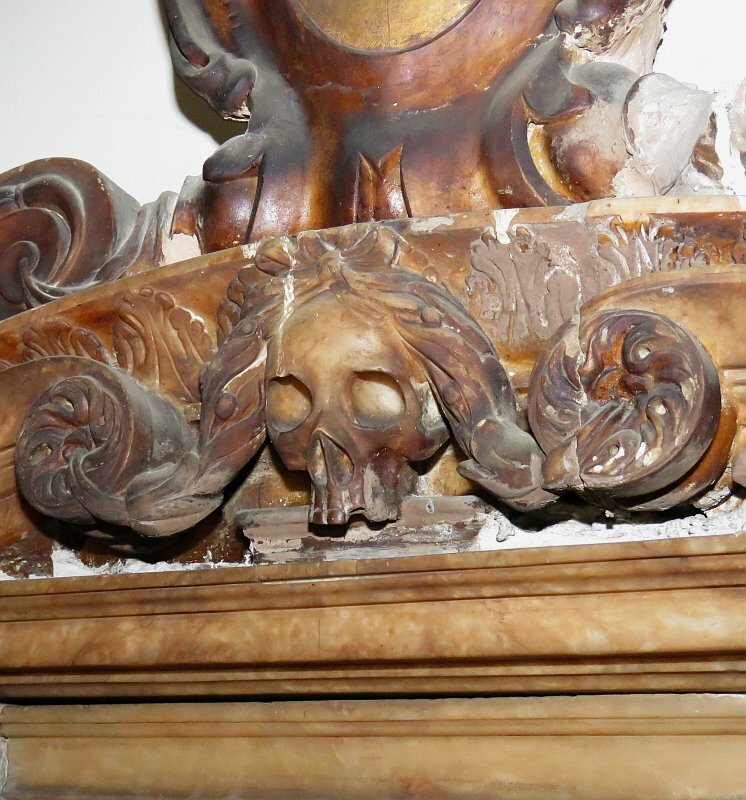 Above is a shallow, curved pediment within which is a memento mori in the shape of a well carved skull, jawless, as was the norm, with curly elements to the sides (lots more carved skulls on this page). On top is a bit of scrolling supporting a painted cartouche of arms. At the base is a broad shelf, supported on two moulded brackets. An excellent piece. 17th Century decorated panels: Sir E. Dowce and Eliz. Roberts . Elizabeth Roberts, d.1658 , and mother, Dame Francees Howland, (sic) d.1668 . With two parallel panels, the one to the mother presumably left blank and then added later. 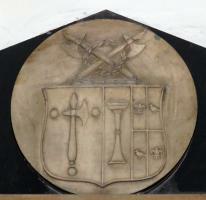 With five shields on the pale stone surround, showing the uniting of two grand families. To left and right, tied drapes, puffed up and containing fruit, all gilt. 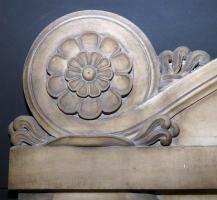 A curly pediment is formed at the top by two downward pointing bunches of drapery, leaves and flowers or fruit. James Gibbs, the architect . 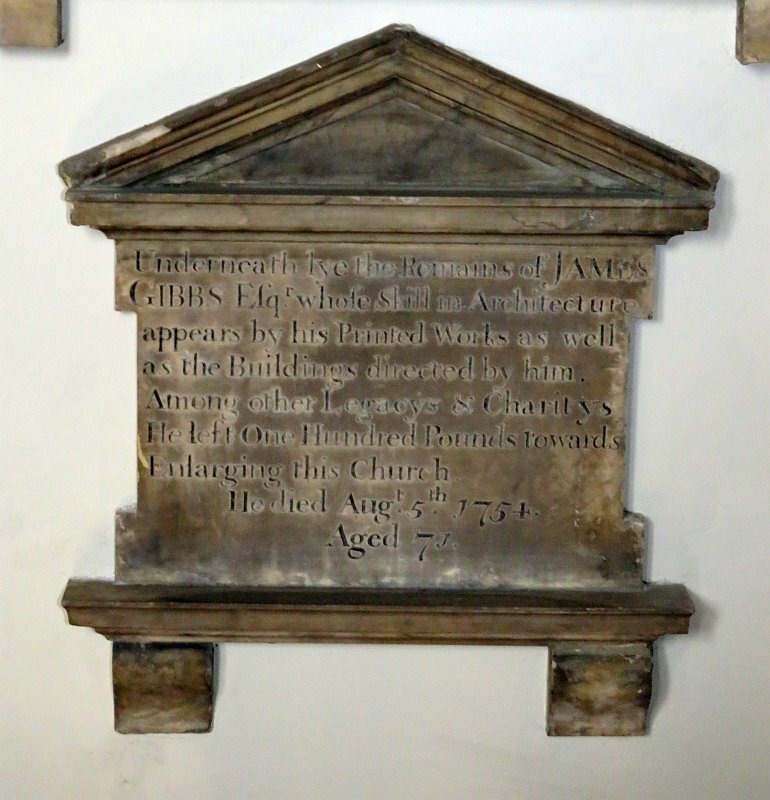 James Gibbs, d.1754 , the important architect who designed St Martin in the Fields Church in Trafalgar Square. ‘Among other Legacys & Charitys // He left One Hundred Pounds towards // Enlarging this Church’. A humble panel, with a pediment sitting directly on top, and a little shelf below, supported by two moulded brackets. Giuseppe Baretti, d.1789 , with a bust showing a powerful, fleshy face, and hair tied at the back. Signed prominently by Thomas Banks RA, an important sculptor. 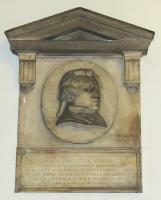 The brief inscription notes that Baretti was ‘a native of Piedmont in Italy, Secretary of Foreign Correspondence, to the Royal Academy of Arts of London, Author of several esteemed works in his own and the languages of France and of England.’ The portrait is in a roundel, on an almost square backing with protruding pediment and side pillar-tops acting as brackets. Thomas Banks, sculptor: Guiseppe Barretti, and Stephen Storace . Charles Brietzcke, d.1795 , and his son Lieutenant Charles Ware Brietzcke , d.1795. Plain panel with a thin inscribed border. 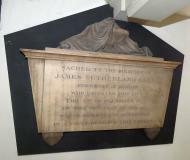 Peter Oliver, d.1795 , very crisp text, with a backing of grey streaked marble shaped as a casket-tomb end, with pediment bearing a small shield, and below, a simple wreath. Signed by the masons Moore & Smith. Stephen Storace, d.1796 , composer, with ‘a life devoted to the study of musical science, and shorten’d by unremitted application and anxiety in attainment of its object’. 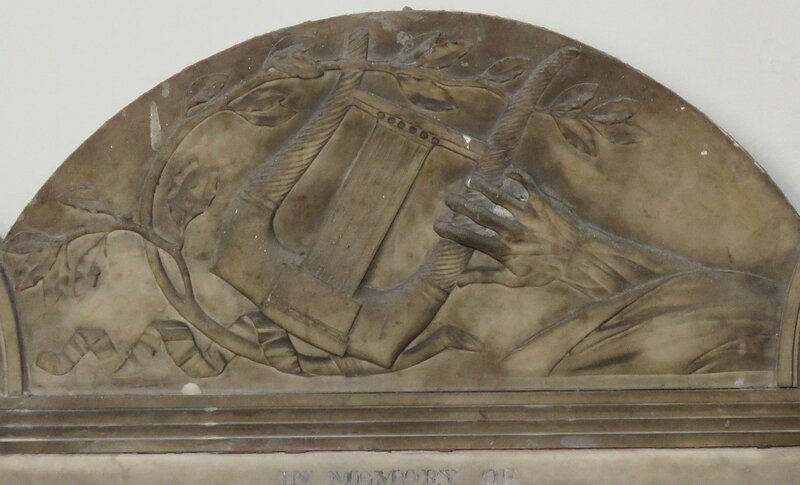 The inscribed panel has a fluted border, and a curved, rimless pediment above with an interesting sculptural design, of a harp clutched by a powerful hand (se picture above right), and partially encircled by a sprig of olive, with a n unrolling ribbon around it. There are acroteria to each side, and at the base, two block supports. By Thomas Banks RA, whom we met as the sculptor of the Baretti portrait. 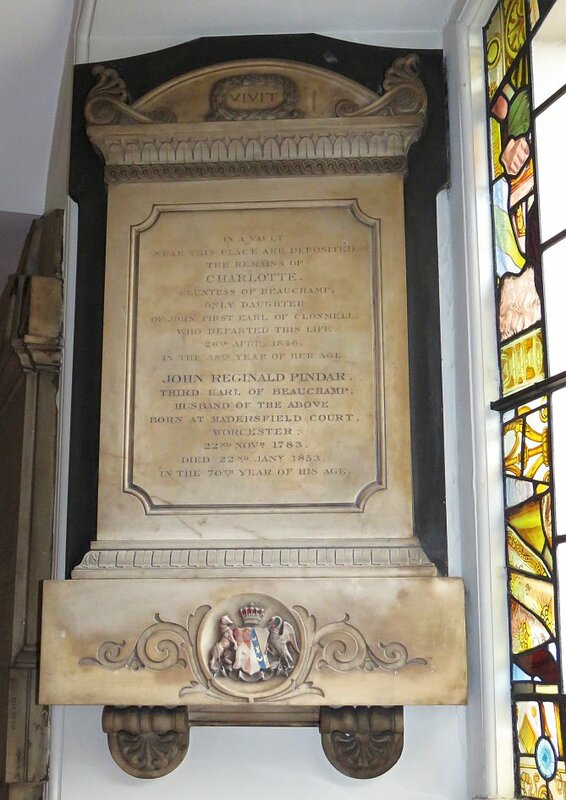 John Purling, d.1800 . An obelisk monument, a type which appeared in the early 18th Century and was revived around 1800, the time of this piece, with variations. This one is fairly conventional, in that it consists of two parts: the obelisk on top, with a carved pot in alto relievo in front of it, then a shelf, and the lower portion containing the inscription on a rectangular panel, here with feet at the base. The obelisk portion takes up about two thirds of the total height, not unusual, but is tapering more than normal, though the proportions look good to the eye, and is brownish rather than black. The monument is somewhat decayed, and may have once hung in an exposed position. Obelisk monuments, c.1800: Purling and Tahourdin . 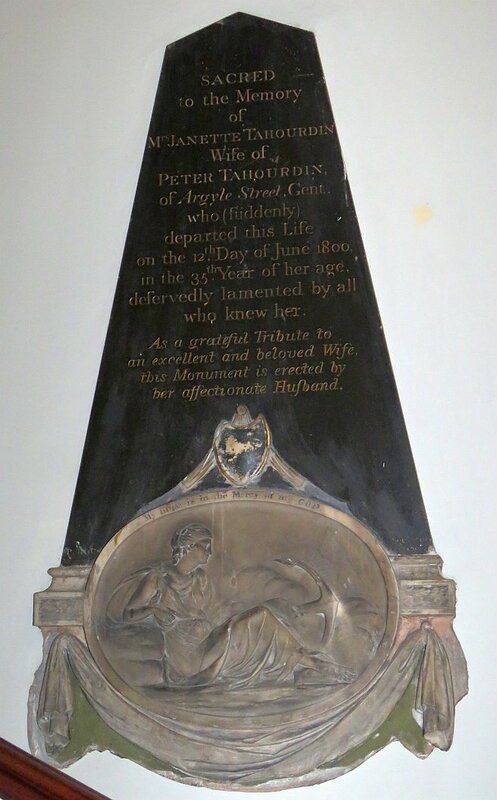 Mrs Janette Tahourdin, d.1800 , a Huguenot, erected by her husband. Another obelisk monument, of the same date to Purling’s monument, but this one not at all conventional. Thus the obelisk contains the inscription cut directly upon it, so that the lower portion, exaggeratedly low, allows for a carved oval which protrudes up and over the front of the obelisk, with a shield of arms upon it, and whose lower part rests upon a carved drape caught at the sides. 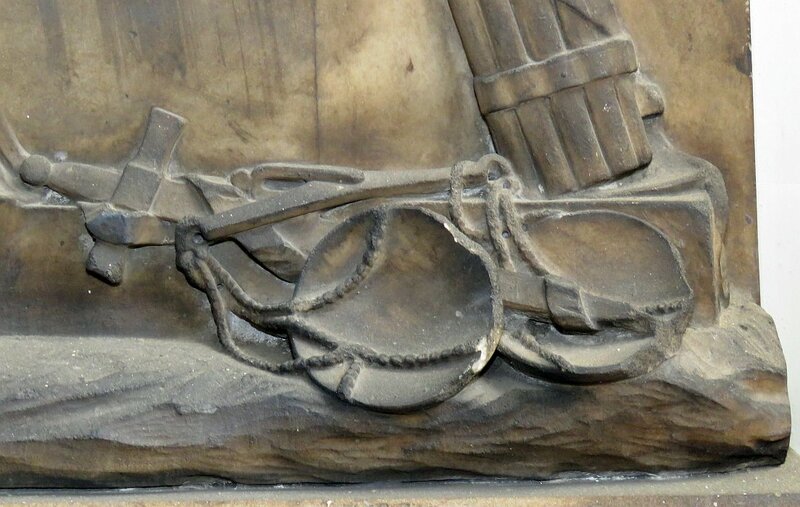 The carving is of a woman, reclining, holding an anchor; she is Classically draped, with sandalled feet, and the focus is on the line of her nearer leg to her raised knee, a gently curve which carries forward to the anchor shaft, and is bisected by the arms. The vague background seems to include some pyramid or ziggurat and vague shadows of trees. A good composition, and quite characterful, especially the face and the feet. On the rim is written ‘My Hope is in the Mercy of my God’. The work is signed and dated (1801) by the sculptor, Peter Rouw the Younger, to left and right of the sculpture on the base of the black obelisk. Martha Dymoke, d.1811 , wife of John Dymoke, ‘the Honourable the King’s Champion of Scrivelsby Court in the County of Lincoln’. In an oval on a narrow backing. Such oval panels were never common, and seem to be found mostly in the later 18th Century and up to about the 1820s. 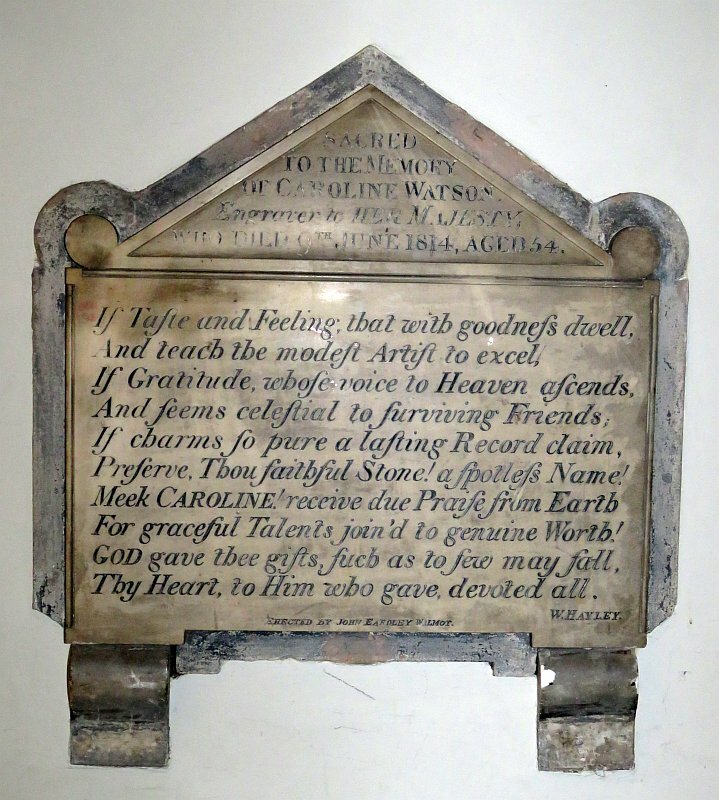 Caroline Watson, d.1814 , with a poetic quote to an earlier Caroline by W. Hayley, in flowing text. A small panel with simple triangle as a pediment, and small brackets, and a very narrow backing, in a style quite frequent during the previous century but by this time extremely old-fashioned. Two centuries on, the distinction is perhaps lost on many viewers. E. Physick, sculptor: Richard Goodwin, d.1836 . 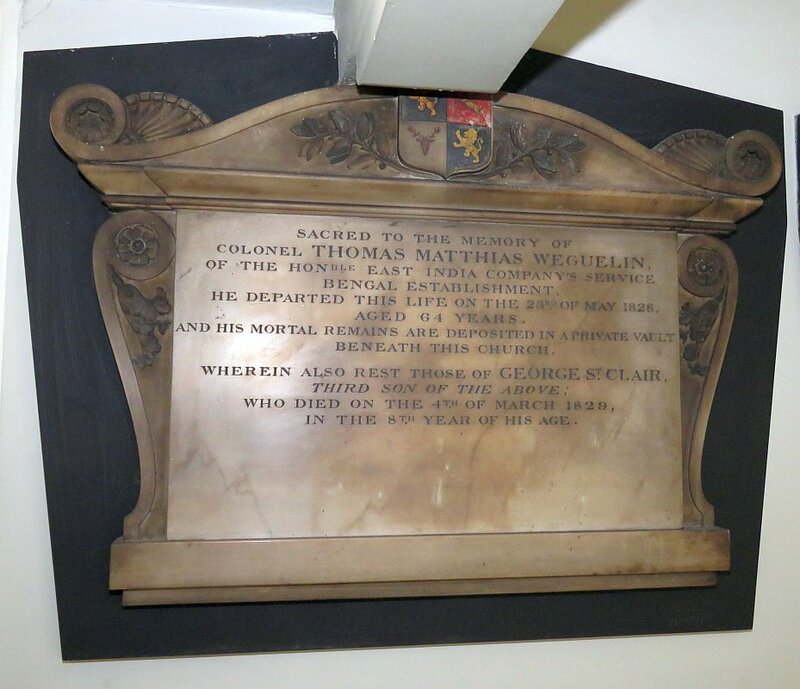 Richard Thomas Goodwin , d.1836 , ‘of the Civil Service of the Honourable East India Company and Member of Council at Bombay’. A tall panel behind a rail, split into upper and lower parts. 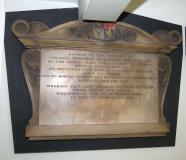 The lower part contains the inscription, and has two block feet and an upper shelf with mouldings. The upper portion, in darker stone, has in front of it a fine sculpture of a mourning girl in alto relievo. 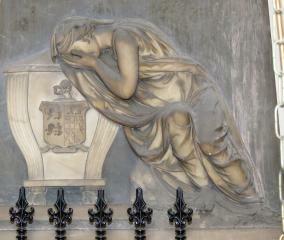 She leans, or rather collapses in grief, against the lid of a casket tomb which bears a shield of arms upon its visible side. Her face is in her hands, and her bare arm makes a nice composition with the generous curves of drapery. This drapery is well conceived, both in the free-hanging swirls and around her lower legs, yet there is something unsatisfactory about the rendering of those legs in the foreshortened space. 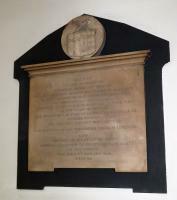 But a fine monument nevertheless, signed by the sculptor, E. Physick of Park Terrace, the first of the six by Physick in the Church. Robert John Grews Lawrence, d.1838 , as a casket end, with eared pediment bearing a small elegant pot; the whole stands on lion feet on a thin support, itself with little legs. On a black rectangular backing. A rather geometric composition. By P. Brothers, sculpt. Obscure. 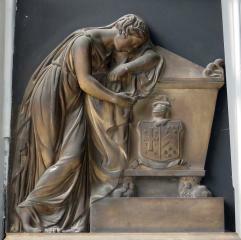 Casket end and tomb chest end: Watson and Lawrence . Now to the main body of the Church. 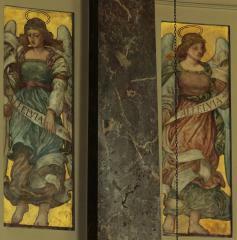 There are around 45 marble panels, ignoring the several simple revival brass panel inscriptions. 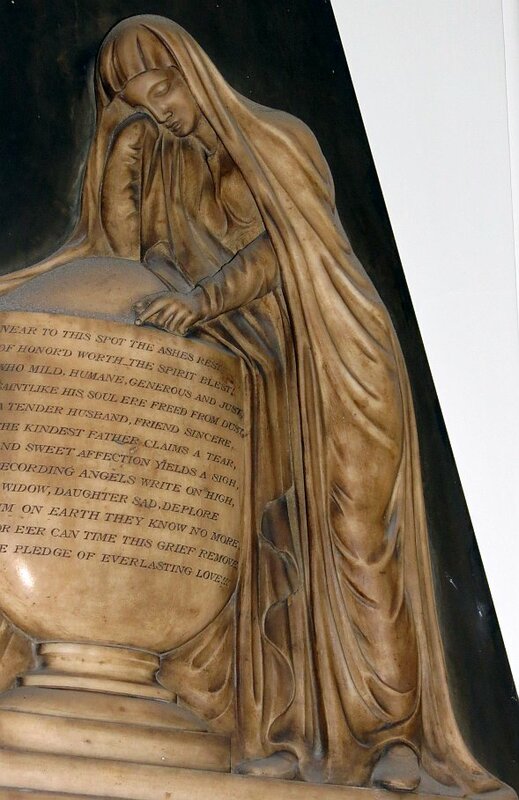 They form a nice sequence from 1814, immediately when the Church was completed, through to the 1840s, with a few from around the end of the 19th Century through to World War I.
W. Whitehead's sculpture of Rachel Taylor, d.1814 . 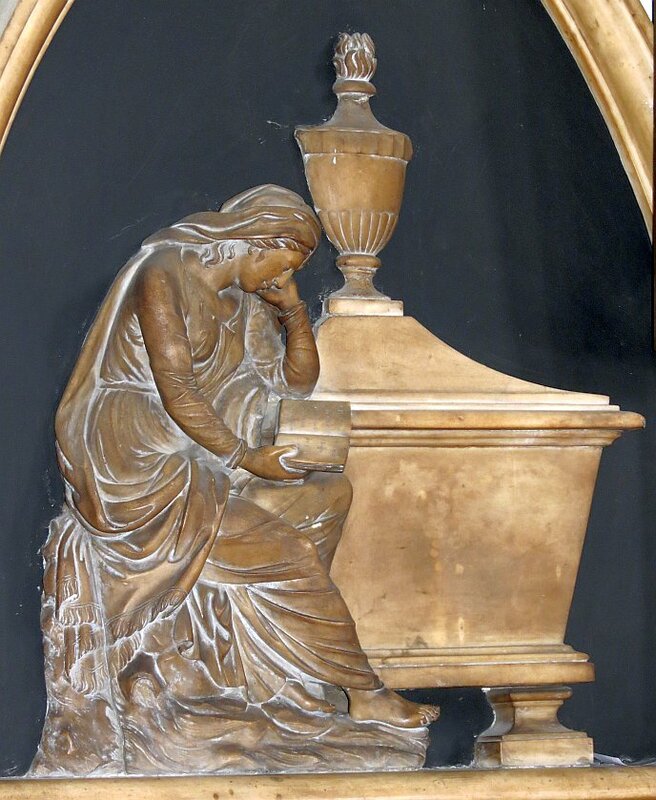 Rachel Taylor, d.1814 , with a high relief sculpture of a seated, reading woman, elbow resting on a table tomb with a flaming pot on top, all under a Gothic arch. The figure is competently done. The face is of a young woman, rather Greek in profile, her hair down to her shoulders, but seen only a little as she wears a cowl; layers of drapery still show the figure underneath, and the pose, with body in three-quarters view, and seated on a rock, unforced and harmonious. Signed by W. Whitehead, Fitzroy Street. Arthur Balfour, d.1817 , with an elegant, rounded pot above with hanging drapes, in front to the one side, behind to the other, both spread out to give a balanced yet unsymmetrical composition; by no means an uncommon treatment, but a good example of it. Signed by William Pistell, one of our New Road sculptors – rather obscure, but see this page. Colonel Hugh Henry Mitchell, d.1817 , with inscription noting he served under Wellington. Panel with upper and lower shelves and cut out pediment, on a shaped black backing. 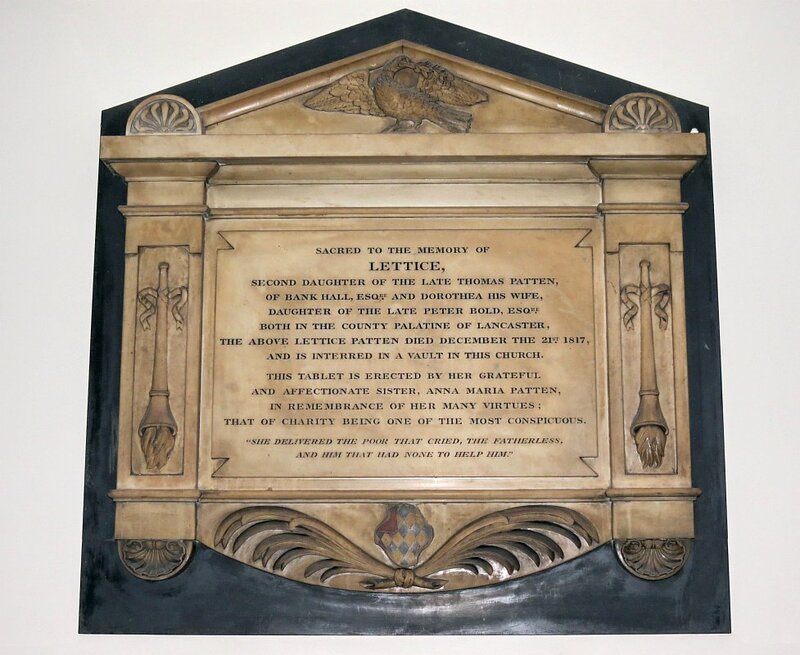 George Lupton, panel to Lettice Patten, d.1817 . Lettice Patten, d.1817 , the tablet having pilasters bearing downward pointing torches, a pediment with a dove, holding a sprig of foliage, in the pediment, and on the apron, crossed branches with a little shield. 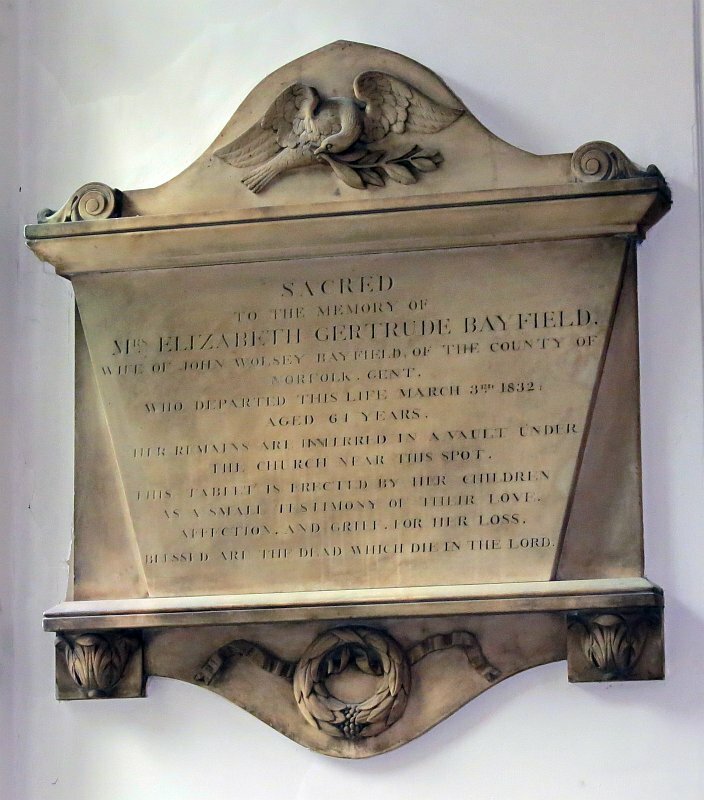 (For related monuments see pictures of Emma Bampfylde and Elizabeth Bayfield monuments below.) 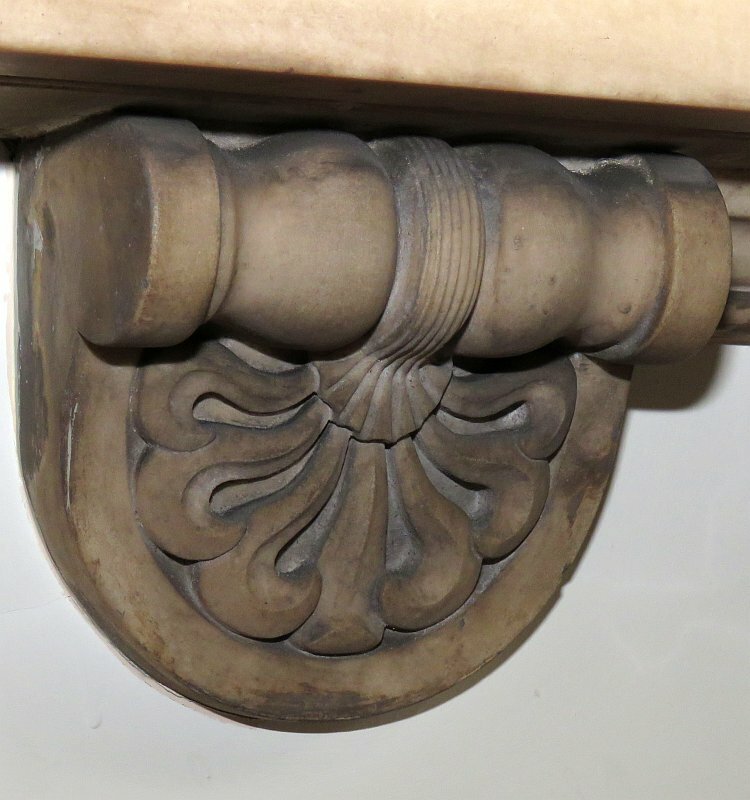 There are little shells on the pilaster bases, and above their tops, the pediment bears rounded ‘ears’ or acroteria with a conventional anemone pattern. 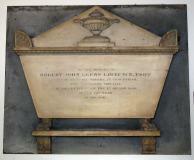 This rather pleasing tablet is the work of George Lupton, who has other work in London churches. 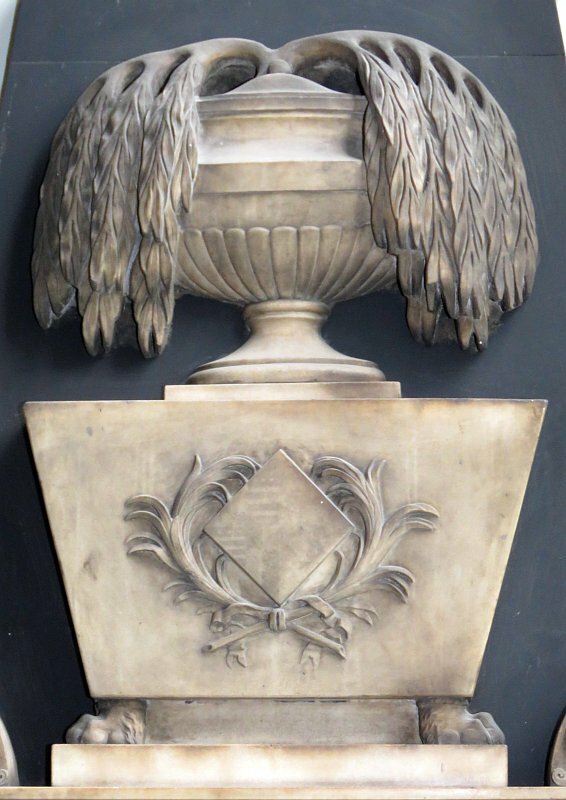 Robert Powney, d.1817 , with a black border round the truncated panel, fluted pilasters, a simple pot against an obelisk-shaped black backing above, and crossed fronds and small shield below. Signed by Whitelaw, New Road. John Bacon Junior's panel to Baronet Sir William Fraser, d.1819 . 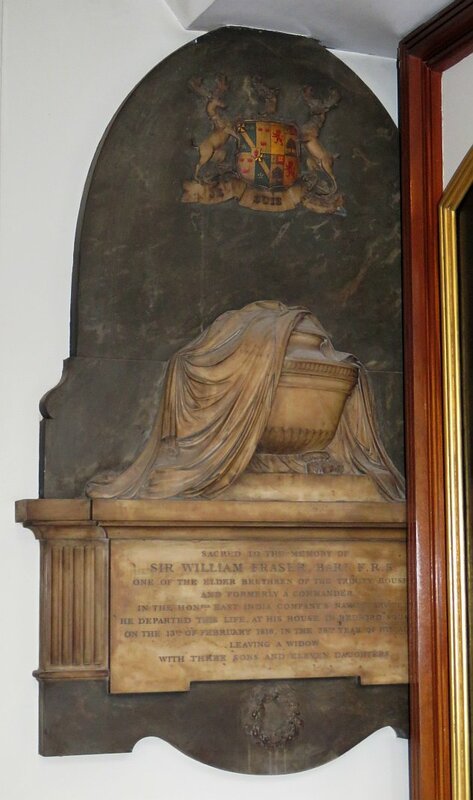 Sir William Fraser, Baronet, d.1819 , with a broad lion-legged pot above, with fine drapery across it, receding pilasters, and little wreath of oak leaves and acorns below. 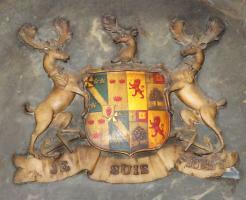 All on a shaped grey and white marble backing, bearing a large coat of arms with pair of rampant stags, two anchors, and another stag’s head in the centre. 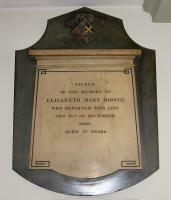 The inscription notes he was one of the elder brethren of Trinity House, and a commander of the East India Company’s Naval Service. By John Bacon Jr, an important sculptor. John McCamon, d.1818 , with fluted pilasters, little foliated bosses underneath them, small fluted pot above against a black backing, shield below. William St Leger, d.1818 , of the 17th Light Dragoons, serving in America, later in Europe and Asia. 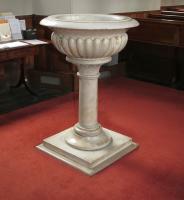 Panel with solid pilasters to the sides, a solid shelf above, supporting a draped pot. Aesthetic floral corbels under the pilasters. Early 19th Century white-on-black panels: McCamon, St Leger, Booth, Hall . 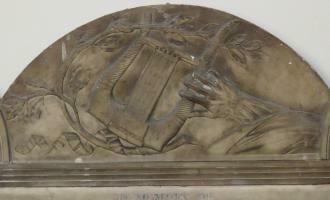 Benjamin Howton, d.1819 , with pilasters and pediment enclosing a low relief pot, on a black backing. Sir James Sibbald, Baronet, d.1819 , with broad fluted pilasters, backing shaped to give a pediment, and a rather excellent heraldic device in the middle of this, consisting of a crown surmounted by a sheaf of corn, with a scythe on each side. Below, a ribbon with the motto ‘Domine factum est’. 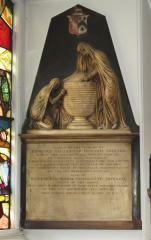 The monument is signed by John Bacon and Samuel Manning. They were partners for some period and produced a lot of monuments. 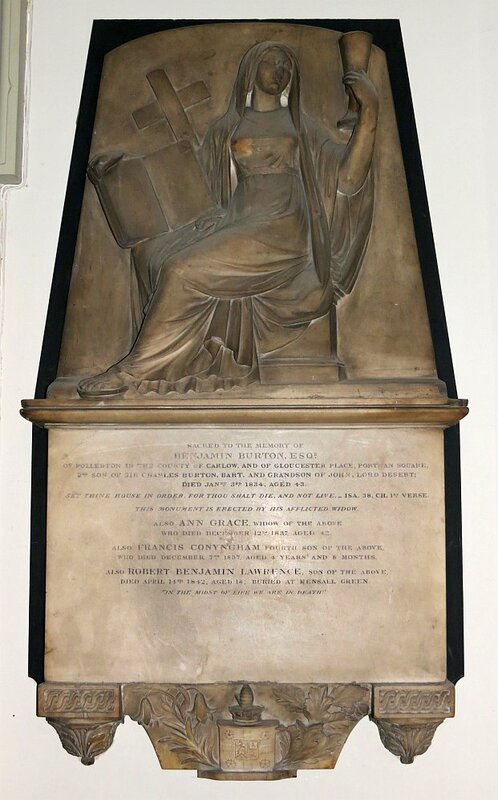 It is thought that after an initial period due mostly to John Bacon (the Younger), a well known sculptor of his time, Manning did most or all of the work of the partnership. Elizabeth Mary Booth, d.1820 , panel with black incised line border, upper shelf, rounded at the bottom as if an apron; shaped black backing and small shield. By C. King of Tottenham Court Road. 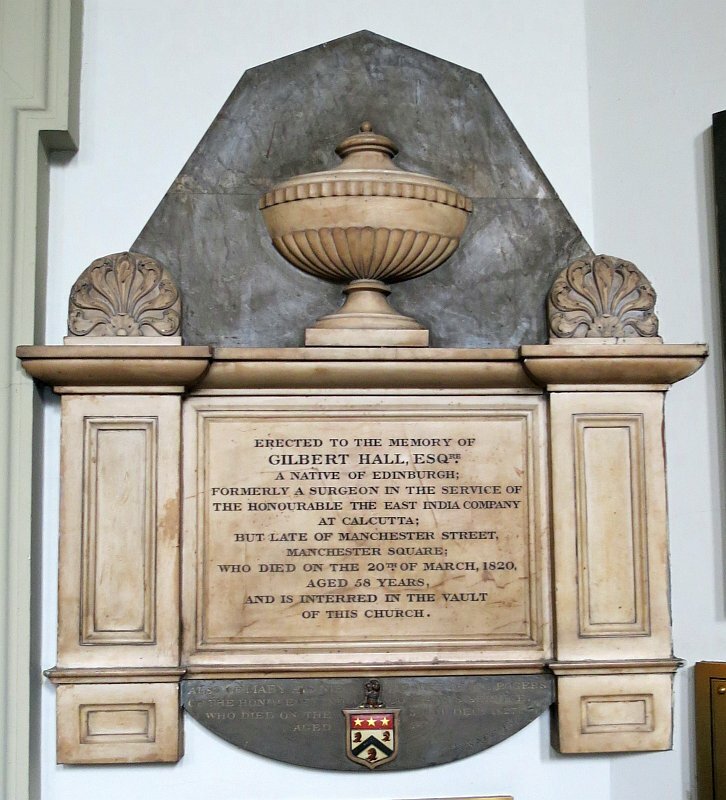 Gilbert Hall, d.1820 , surgeon of the East India Company at Calcutta, with broad pilasters, anemones on top of them and a wide fluted pot, little shield of arms, enamelled, below, on grey backing of wider-than-tall obelisk shape. By John Knapp. 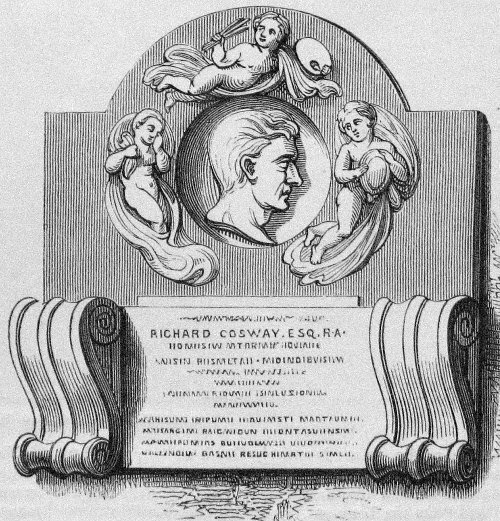 Richard Cosway RA, d.1821 . Richard Cosway, RA, d.1821 is apparently commemorated in the church; I did not see the panel, but here is a woodcut of it, showing the portrait of the great painter, with three cherubs haloing around it. William Gordon Haven, d.1809 , and Charles Mackinen Haven, d.1824 , brothers, panel with receding pilasters, and above, two decorated urns covered in drapes, with obelisk of grey marble behind. 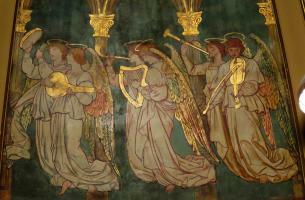 By Bacon & Manning, who made the Baronet Sibbald panel noted above. Emma Catherine Bampfylde, d.1825 , with wreath and ribbons and leafy brackets below, and in the pediment a high relief of a dove flying, a branch in its beak; perhaps the dove returning to the ark as a promise of hope. Elegant and delicate. 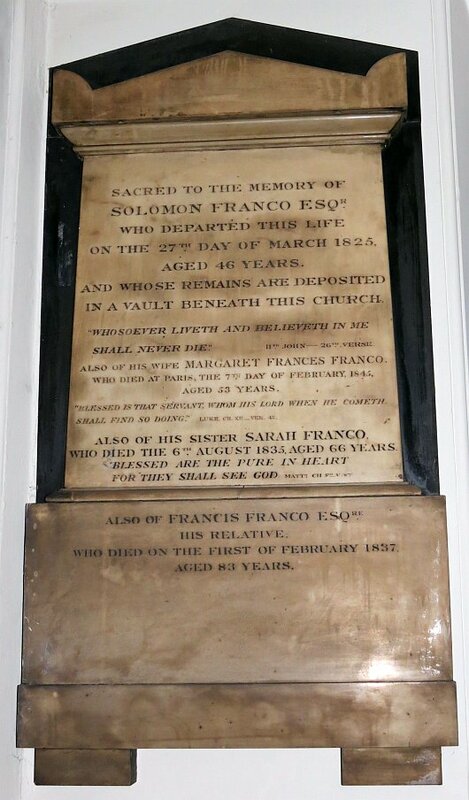 Solomon Franco, d.1825 , sister Sarah, d.1835 , and relative Francis, d.1857 . 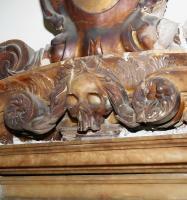 Shaped as the end of a chest tomb, with eared pediment, and deep base with room for more names. By Humphrey Hopper. Hopper was a significant sculptor and mason. Edmund Howard and Henrietta Howard, by Randall, New Road . Edmund Alexander Howard, d.1827 , and wife Henrietta Maria Charlotte Howard, d.1847 , with a pair of mourning figures against a central pot. One kneels, the other stands leaning against the pot, to give a pleasing composition of unsymmetrical triangular outline. Delicate drapery envelopes the figures, drawn up to the head rather than hanging down, giving an effect of movement. The style of the drapes and the poses are medieval, but the faces rather more Classical. 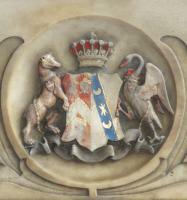 Above, a shield of arms with lion on top. The sculptor signs as Randall, New Road, and this is a work of considerable merit. John Cotton, d.1828 , a more elaborate casket end, Baroque rather than a purer classical, with shield on the curved pediment, rolled acanthus at the sides, brackets with enfolding leaves, and a wreath and ribbon on the apron. Edward Ravenscroft, d.1828 , and wife Emma, d.1848 , the inscription noting that he was ‘descended from an ancient family in Cheshire’. A simple stone panel with shelf and plain brackets, and between them a rather disproportionate apron bearing the shield of arms. 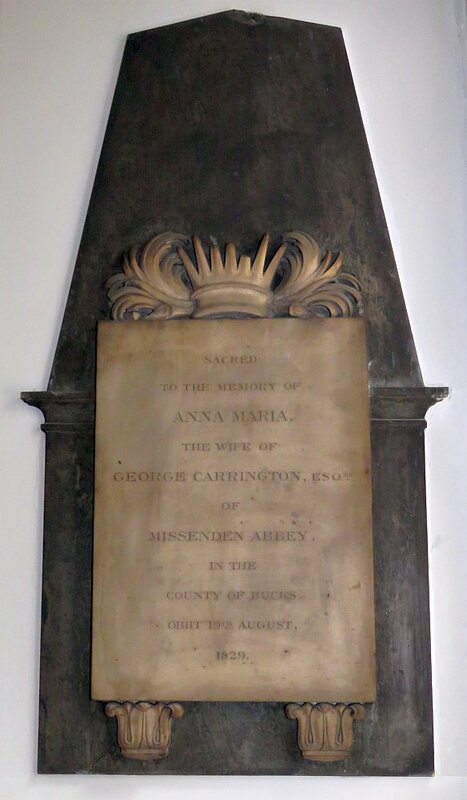 Anna Maria Carrington, d.1829 , of Missenden Abbey. Plain plaque without border, but with spiky crown above flanked by two spiky fronds of foliage, rather unusual. Underneath, two brackets as stylised flowers, and the backing, unusually, with a shelf some small distance below the top of the inscripted panel. This piece is by A. Stothard of 69 Upper Seymour Place, who must be Alfred Joseph Stothard, 1793-1864, son of the well known painter Thomas Stothard RA. He was a medallist, exhibiting at the Royal Academy and his various addresses include this one in 1831, and at number 36 in the sames street a year or two before. 1820s panels, vertical format: Franco, Carrington, Countess of Clonmell . 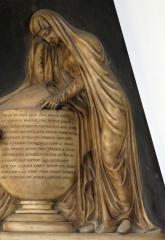 Margaret, Countess of Clonmell, d.1829 , as a panel depicting the end of a table monument. The inscription is surrounded by an incised border, truncated at the corners, with a repeating Egyptian leaf design at the top supporting an elegant curved and eared pediment. The word ‘Vivit’ [He lives] appears in the centre, surrounded by a wreath. A narrow black background is above and to the sides, and on the foot, another Egyptian pattern, the whole being on a chunky base which could have been improved with some carving. Below that, two rectangular brackets bearing stylised flowers. The monument is signed by C. Smith, 37 Gloucester Place, New Road. 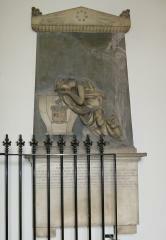 There were several sculptors of this name, some related, including Charles R. Smith, with some significant works to his name, including the William Williams monument in Chichester Cathedral. His dates are 1798-1888, which is plausible for this work – and see note on Charlotte, Countess of Beauchamp below. John Bebb, d.1830 , with a eulogy, and on the base, a brief note to his wife, Janet Laurence Webb, d.1850 . A satisfyingly solid, framed panel, with a pediment bearing shield of arms, floralities, with curls at the side, and a nice line of ivy at frieze level. Signed by C. Thompson of Osnaburgh Street, and a very decent piece of work. Isabella Mary Fairlie, d.1830 , first wife of John Fairlie, second wife Louisa, d.1843 and three children of the latter. A tall, plain panel on a thick base with stylised leaves. 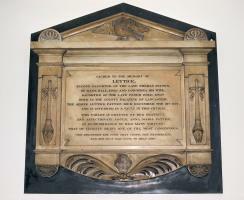 The height of the main panel is such that it must have been intended as a memorial for many more of the family. Joseph Fernandez Madrid, d.1830 , Envoy Extraordinary and Minister Plenipotentiary from the Republic of Columbia, plain stone chest-tomb end with shelf. Clementina Malcolm, d.1830 , chest tomb end with pediment and beneath the shelf, a line of tall leaves, giving an Egyptian appearance. 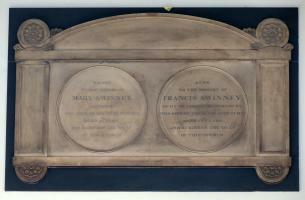 James Cruikshank, d.1831 , and daughter Mary Dansey, d.1830 . The inscription notes he was ‘of Ballards Valley St Mary’s in the Island of Jamaica and of Gloucester Street, Portman Square’. 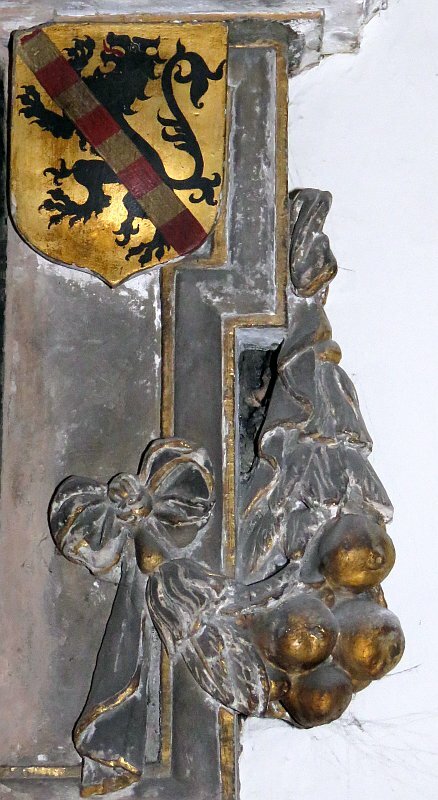 A charmingly carved panel, with baroque shaping, shield above with a nicely delineated thistle on top, wreath and ribbons below as in the Emma Bampfylde monument noted above, and brackets with little veined leaves. 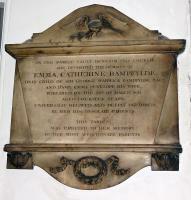 Emma Bampfylde and Elizabeth Bayfield monuments . 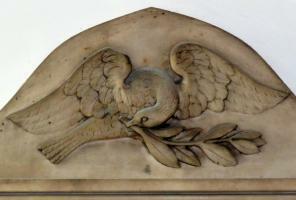 Elizabeth Bayfield, d.1832 , very similar to the Emma Bampfylde monument noted above of seven years' previously, with the same general design with dove above, wreath and ribbon below, but differing in the detail, for example that the dove is facing in the opposite direction and the ribbon is more twisted. Sir John Sewell, Kt, d.1833 , erected by his wife Dame Ann Sewell. The inscription notes various offices held by the deceased, including Judge of the Vice Admiralty Court of Malta, from its establishment until 1813. The panel has a rounded top, unornamented, but at the base is a shelf with a line of Roman S-shaped repeating pattern, very crisp and bold, and each of the brackets has a pair of roundels, stylised buds with just-opening petals. This is a modest work by Peter Rouw the Younger, whom we met in the Tahourdin monument noted above. Willson, Bath Place, New Road - sculpture for the Burton family . Benjamin Burton, d.1834 , wife Ann, d.1837 , and two offspring. 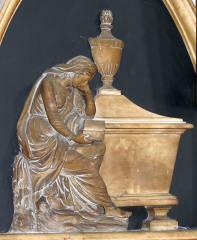 Above the inscription is a panel showing a seated woman, holding an open book and, in her other hand, a tall goblet or chalice; behind her is a cross. The treatment rather varied, with the detail less good than the overall effect. 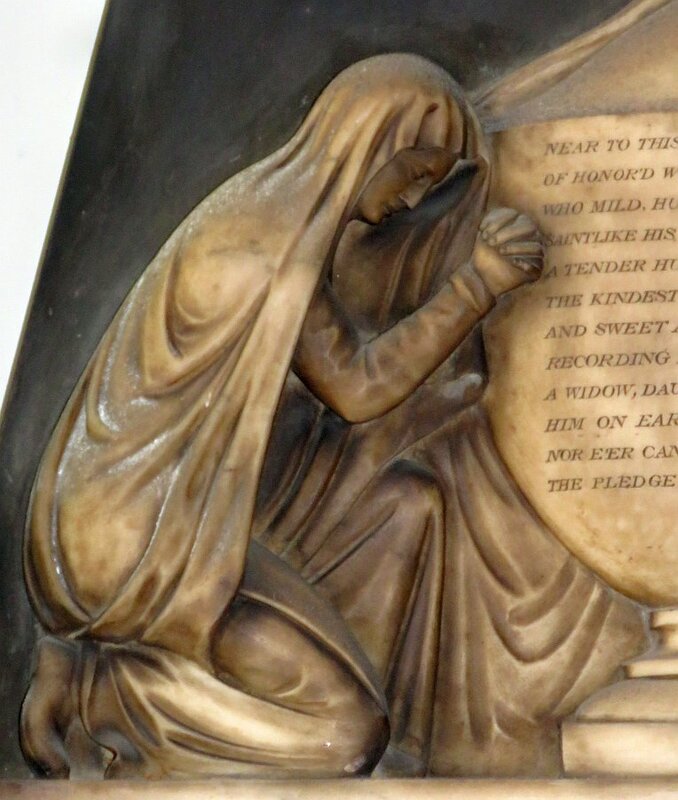 Presuming this figure to be the wife of Mr Burton, she is seated somewhat inelegantly on some concealed object which looks to be the casket tomb of her husband. The base of the monument, a narrow apron and flanking brackets, is nicely carved with leaves and a bluebell in low relief around a small shield of arms. The sculptor signs his work as Willson, Sculptor, Bath Place, New Road. 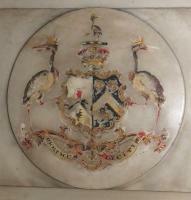 Humphrey Hopper's panel to Lord and Lady Teignmouth . John Lord Teignmouth, d.1834 , wife Charlotte Lady Teignmouth, d.1834 , three infant daughters, and the Hon. Henry Dundas Shore, d.1828 . The inscription rather worn. 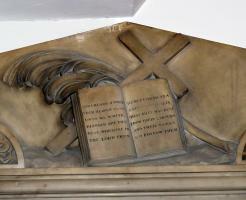 The panel has receding sides, and above, a raised portion with a high relief of an open book with Biblical quote, behind which are a crossed branch and crucifix, bold and appropriately sized. 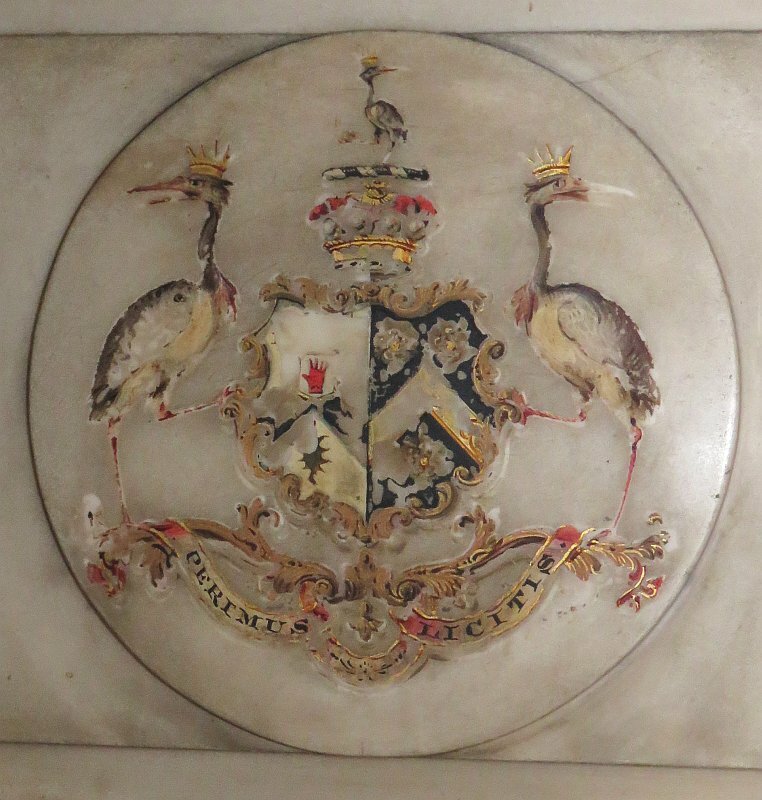 Underneath, a roundel contains the coat of arms, which has lost some of its paint, but includes two crowned cranes. 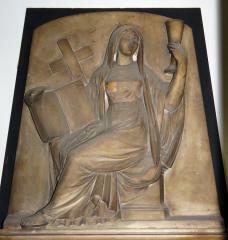 This is a work by the notable monumental sculptor, Humphrey Hopper, and the book, foliage and cross are typical motifs of his. We met his work above in the Bampfylde panel. David Carruthers, d.1835 , and wife Mary, d.1845 . He was MP for Kingston upon Hull. A well cut panel with shelf above, Roman S-shaped design at the base, and on the apron, shield with tiny cherubic head on it, ribbon below, and two branches, one rather reedy, the other some plant with little berries. Hon. Ellen Mary Fletcher, d.1835 , with at the base a brief inscription to Robert Anderson , all rather worn. Blocky, eared and pedimented, with a small shield and a repeating pattern of Egyptianising leaflets. By Humphrey Hopper again. Charles R. Smith's panel to Charlotte, Countess of Beauchamp, d.1846 . Charlotte, Countess of Beauchamp, d.1846 , and husband John Reginald Pindar, 3rd Earl of Beauchamp, d.1853 . 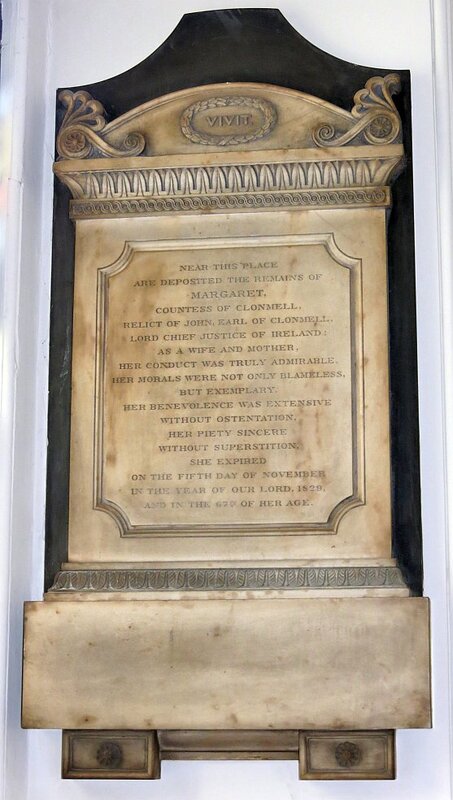 The inscription notes she was only daughter of John, 1st Earl of Clonmell, and the monument is in the same style as that to Margaret, Countess of Clonmell noted above. 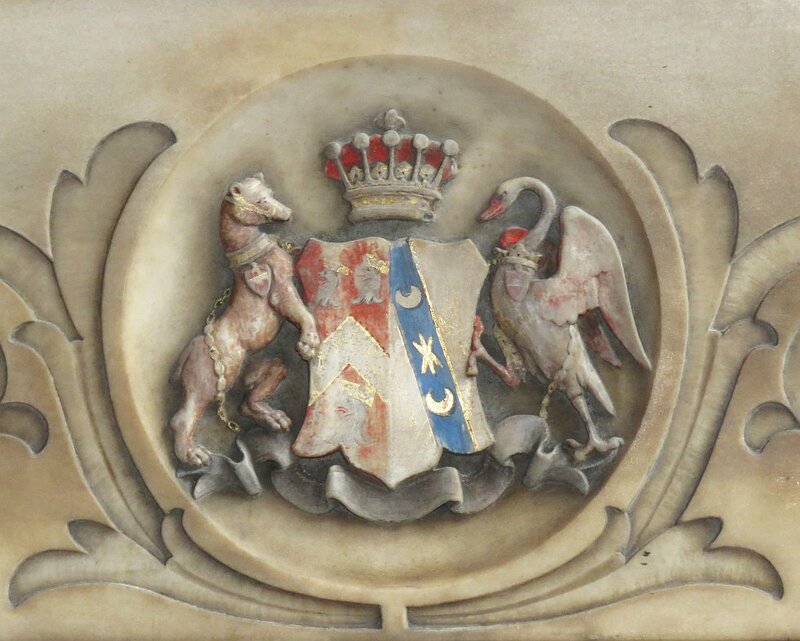 However, it also includes on the base a carved coat of arms, with slight surrounding decoration in low relief; the shield is crowned and supported by a rampant bear with a chain, and a delicately carved swan. The work of Charles R. Smith – see note to the Countess of Clonmell monument above. Louisa Harcourt, Countess of Beverley, d.1848 . 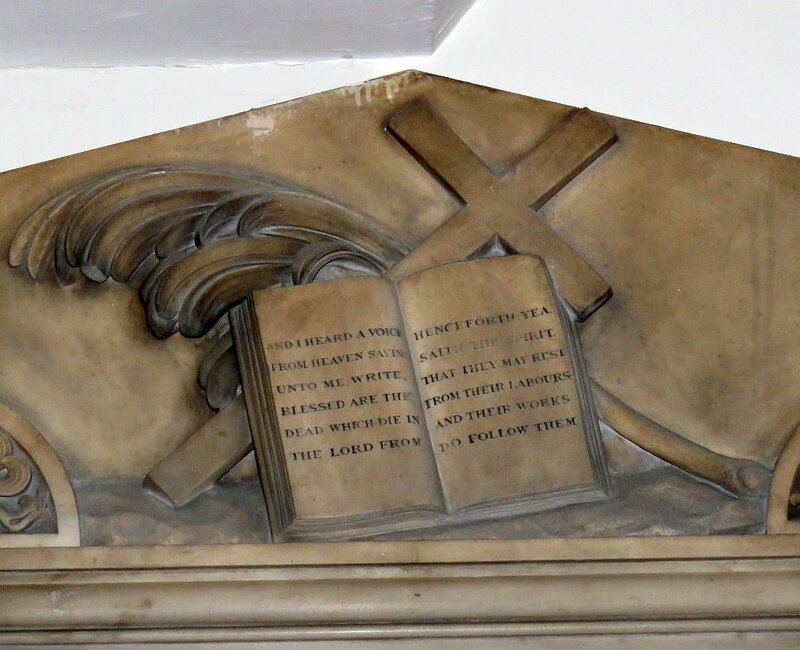 Only part of the monument can be seen, a chunky affair with heavy upper shelf with mouldings, and a broken-off cross at the top, on a black backing. William Joachim and Martha Joachim , and their daughter Martha Joachim , undated but likely from late in the 19th Century, with a roundel with low relief Lamb of God and minor carved scrolling and foliage. The sculptor is an important one – J.E. Boehm. Geoffrey V. Pearce, d.1914 , of the 2nd Royal Warwickshire Regiment, commissioned from the Artists Rifles. An Arts and Crafts monument, with a surround of beaten metal and coloured stone, and a small domed panel above in the pediment, again in metal, showing St George slaying the dragon, a scaly beast with long, writhing tail. Characteristic of the art of the period from just before the turn of the century which came quickly to an end with the outbreak of war. Lt. Commander John White, d.1916 . 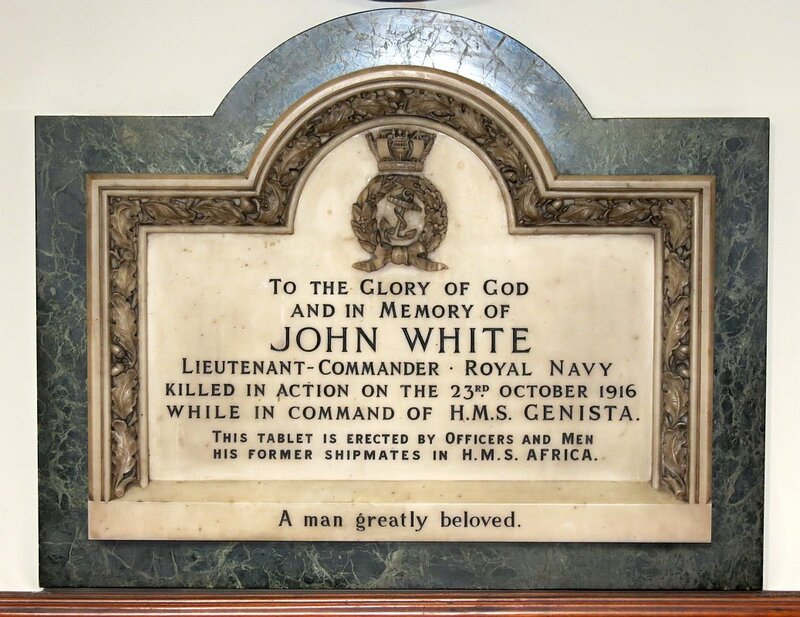 John White, d.1916 , Lt Commander of the Royal Navy, killed in action while in command of HMS Genista, the tablet being erected by his former shipmates in HMS Africa. 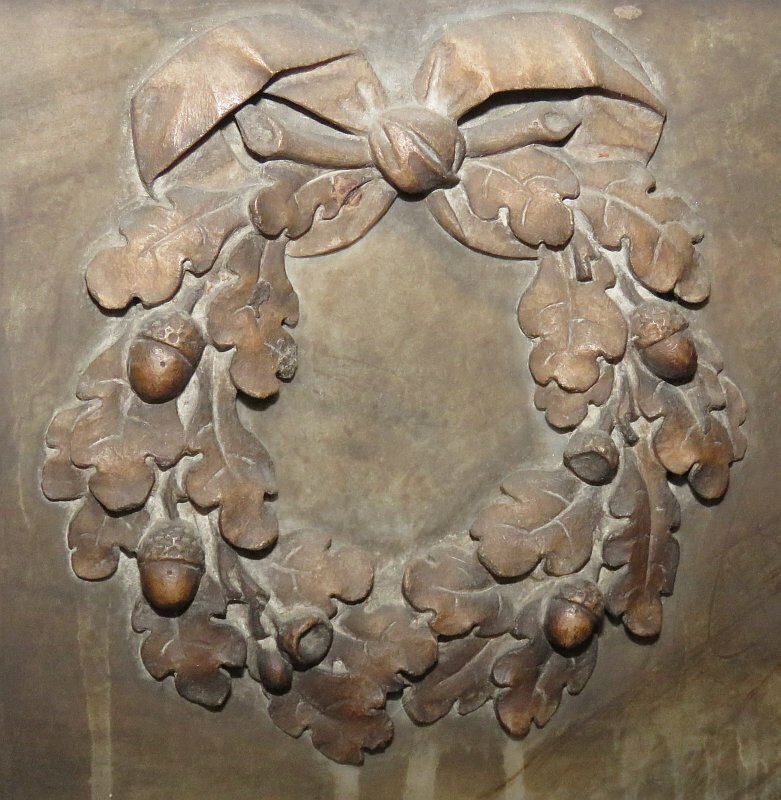 Panel with semicircular top bearing wreath and crown, border of oak leaves and acorns, and serpentine surround. Good work of its period. William Henry White, d.1926 , and wife Sarah Anne who died the same year; plain, pale marble plaque on a grey veined backing. This page does not note the several 19th –early 20th Century brass panels, other than to point to the Greenwell brass, which is typical of the better style of such things, with coloured initial letters and inscribed decoration. Not so easy to get to, but if you cannot, a fair number of the panels noted here can be seen from downstairs. Charles Elphinstone, d. 1807 , and sister Elizabeth, d.1802 . 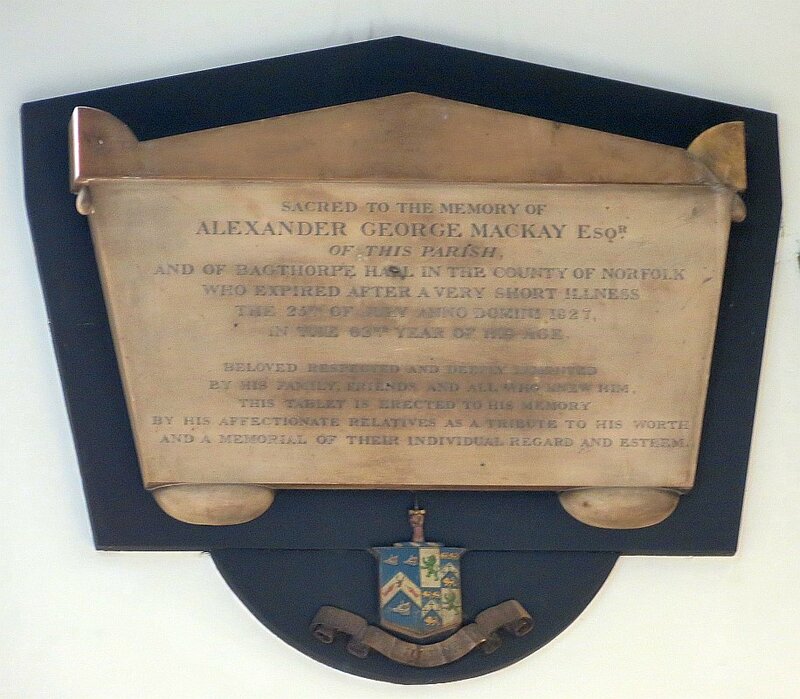 The inscription noting that ‘in returning from India, where he had greatly distinguished himself by the capture of a force of the enemy very superior [in numbers we presume, but not fighting quality], he was lost in HMS Blenheim’. Stone panel with frame and blank pediment. Signed by T. Marsh of New Road. General Robert Morse, 1818, by Samuel Colecom . General Robert Morse, d.1818 , who ‘served his country gallantly afield in France, Germany, Holland, the West Indies and America’ and was later Inspector General of Fortifications. 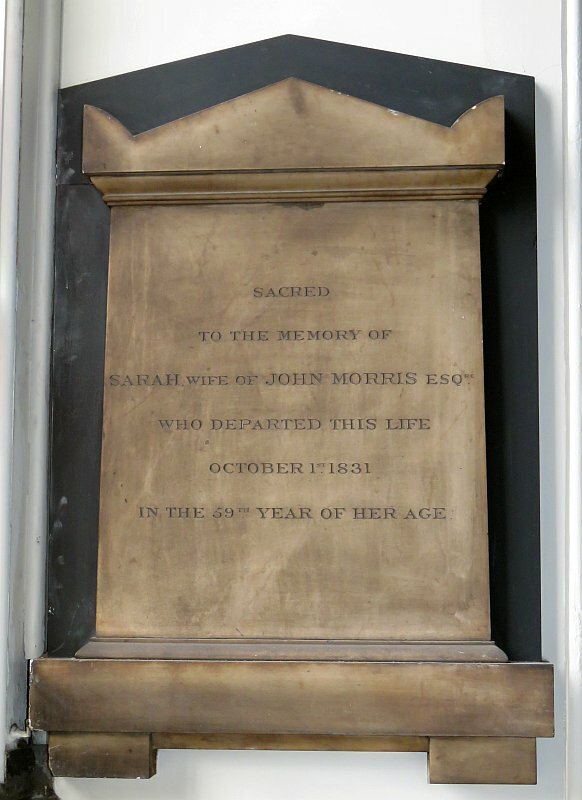 And his wife, Sophia [Godin] Morse, d.1818 . Plain panel with upper shelf and cut with small feet at the base, with a shield of arms carved above in a roundel, on a black backing cut with pediment above, feet below. 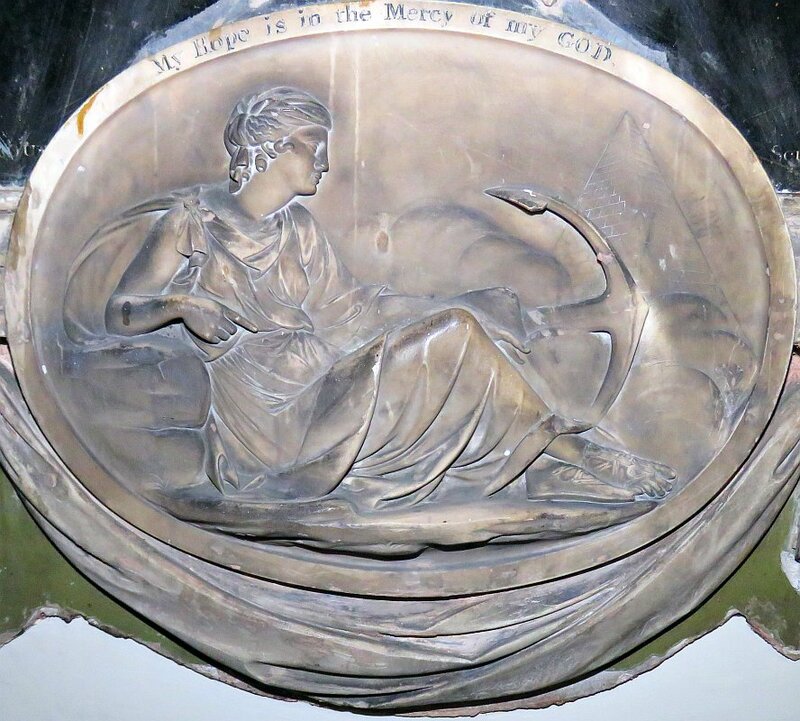 Of interest as an example of the work of Samuel Colecom, sculptor of the monument to Samuel Joliffe in Petersfield Church..
Maria Mackenzie, d.1821 , with a brief Latin inscription. Broad, low panel with an upper shelf, somewhat projecting, with repeating ornament including stylised flowers, and at the top, scrolls to the sides. The base projects in a series of steps and is supported on mouldings, painted black and on a black backing. Jane, Lady Staunton, d.1823 , wife of Sir George Leonard Staunton Baronet, of Cargin, County Galway, Ireland. Rather austere Classical panel in a frame, with pediment above, blocky base on two brackets, and much plain moulding. Signed by Artaud of Wimpole Street, who is obscure to me. Augusta Kirkland, d.1824 , Augusta Elizabeth Kirkland, d.1824 , and two daughters, and with an added inscription at the bottom to her brother, Edward Agmondisham Vesey,d.1830 , of his Majesty’s Treasury. 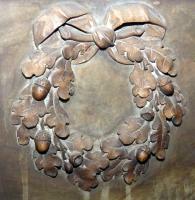 Eared, with curly pediment enclosing flowers. Signed by Sir Richard Westmacott RA, one of the most important sculptors of his time, responsible for the pediment of the British Museum among many public works. Alexander George MacKay, d.1827 , a simple tomb chest end, with ears and rounded feet, on a black backing with an apron with a coat of arms. 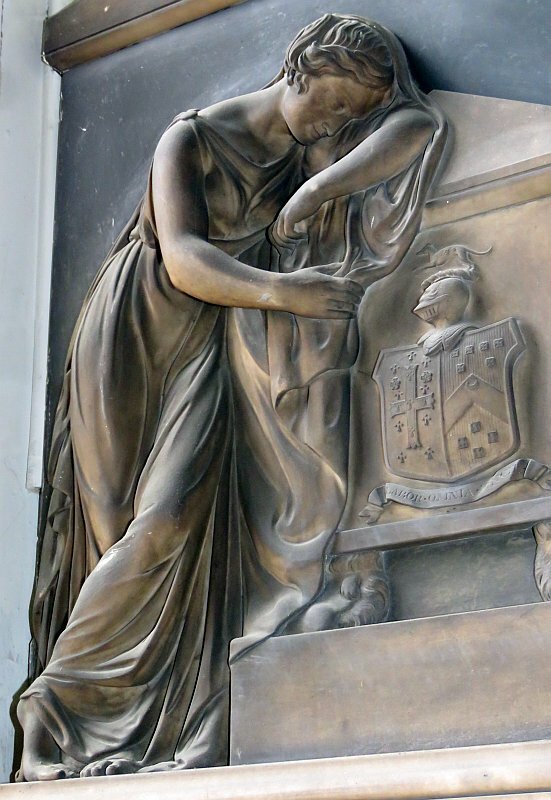 Knapp of Foley Street, statuary: Lyon and Hall monuments . 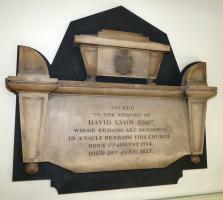 David Lyon, d.1827 , a chest tomb end, with strange pilasters much wider at the top, large ears, a smaller casket on top bearing a small shield, all on a shaped black backing. Knapp of Foley Street was the stonemason. James Sutherland, d.1828 , formerly of Bombay, another chest tomb end, with a small draped pot on top, on a black pentagonal backing. Made by Stephen Radburn, obscure. Late 1820s horizontal panels: Mackay, Sutherland, and Captain Thomas Weguelin . Col. Thomas Matthias Weguelin, d. 1828 , a horizontal panel with curvy pediment and sides, on a black backing. The panel is signed by Humphrey Hopper, whom we met above in several monuments. George Weguelin, d.1858 , next to the Colonel, and identical, is also by Humphrey Hopper. 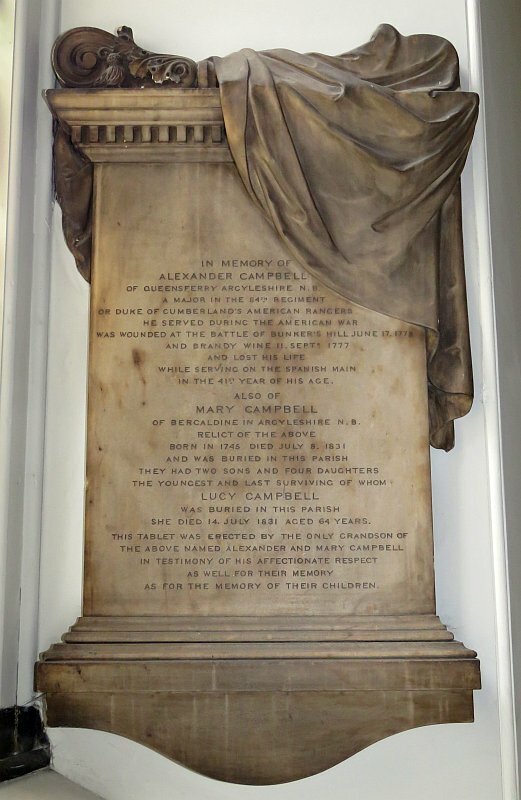 Major Alexander Campbell , no date, of the Duke of Cumberland’s American Rangers, his wife Mary Campbell, d.1831 , and daughter Lucy Campbell, d.1831 , erected by his grandson. 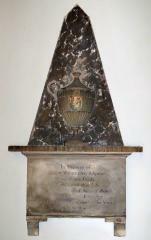 Plaque with upper shelf with one visible acroterion, curled and with vegetative carved decoration, the other covered by a drape which hangs over the corner of the monument and down on one side. The bottom has the usual shelf, with several stages of stepped moulding, and a shallow curved apron which perhaps once contained a painted coat of arms or other symbol. Signed by C. Smith, 37 Gloucester Place, New Road. Robert Fullerton, d.1851 , and wife Harriet, d.1850 . He was Governor of Prince of Wales Island, where his wife died, and also worked for the East India Company. A heavy monument, with eared pediment and entablature, thick base bearing shield and lightly incised carved leaves with tendrils, and two unornamented brackets. 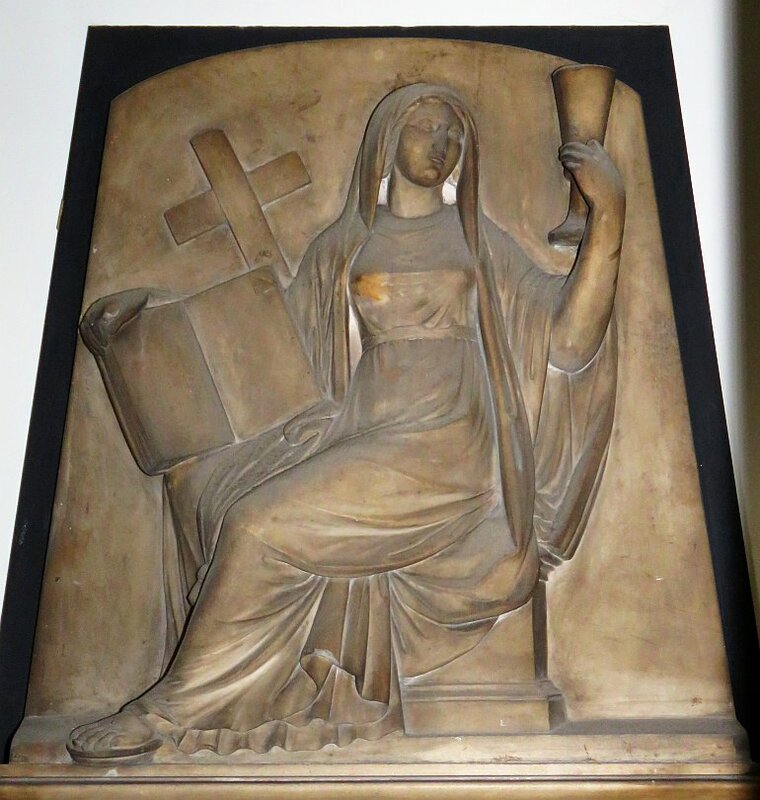 By the sculptor Edward Physick, whom we have already met downstairs. Sarah Morris, d.1831 , crisply cut on a panel with lower shelf and upper flat, eared pediment. Vertical panels of the 1830s: Campbell, Morris, Carruthers and Shank . 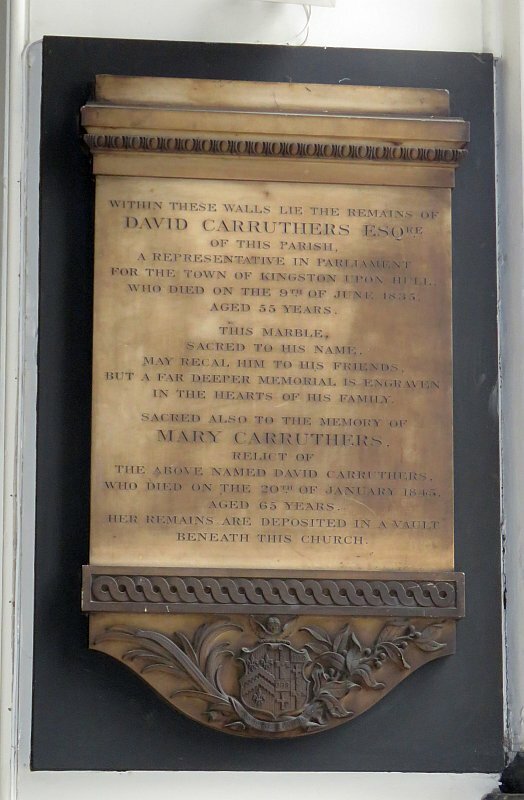 David Carruthers, d.1835 , one-time MP for Kingston upon Hull, and his wife Mary Carruthers, d.1845 . Another tall panel with ornate base. At the top, a projecting shelf with repeated carved decorative elements, a basal shelf with Roman S-shaped ornament, and beneath this, the coat of arms on the apron is flanked by generous carvings of an olive branch and a ferny one. On a rectangular black backing. Crisp work, by the Patent Works, Westminster. Anna Maria Shank, d.1835 , and her daughter Diana Henrietta Shank, d.1836 , and her husband Henry Shank, d.1860 . Tall panel, with pediment at the top, bearing acroteria at the side and, oddly, within the pediment itself. No entablature, but nice repeating carved patterns in a band underneath. At the base, the usual thick slab, here bearing small painted arms, and resting on two block supports each with a further carved anthemion. Revd. George Augustus Thursby, d.1836 . Simple panel with upper shelf, cut to pediment shape above that, and lower shelf cut to a narrow apron below. On a shaped black backing. E. Physick, sculptor: James Bishop monument . 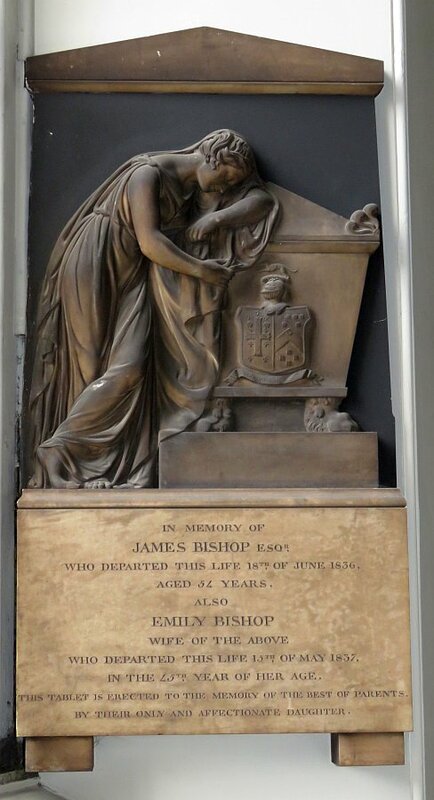 James Bishop, d.1836 , and his wife, Emily Bishop, d.1837 , erected by their daughter. A nice figure piece, which can just be seen from downstairs. 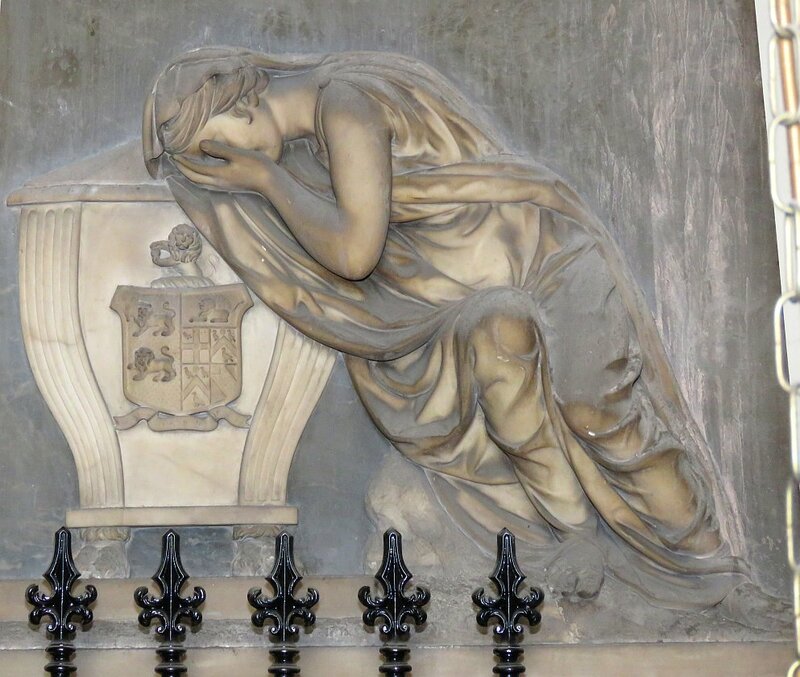 We see a fine carving of a mourning girl, shown leaning against the side of a casket tomb, which bears upon it a shield of arms, and has lion feet. The girl has the 18th Century affectation of standing with crossed legs, looking rather casual to modern eyes, but the lines of her drapery are simple and elegant, flowing around the contours of her legs and stomach, and her arms are posed in a harmonious cradle. Her head leans upon one arm or shoulder, showing her long slender neck to advantage. For the rest, above is a blank pediment, and below the inscription is on a plain block, with two block supports below. 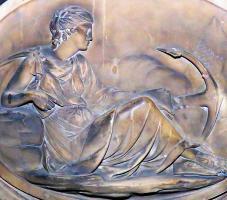 E. Physick of Park Terrace was the sculptor. Henry Barre Beresford, d.1837 , of Learmount County Londonderry, son of the Rt. 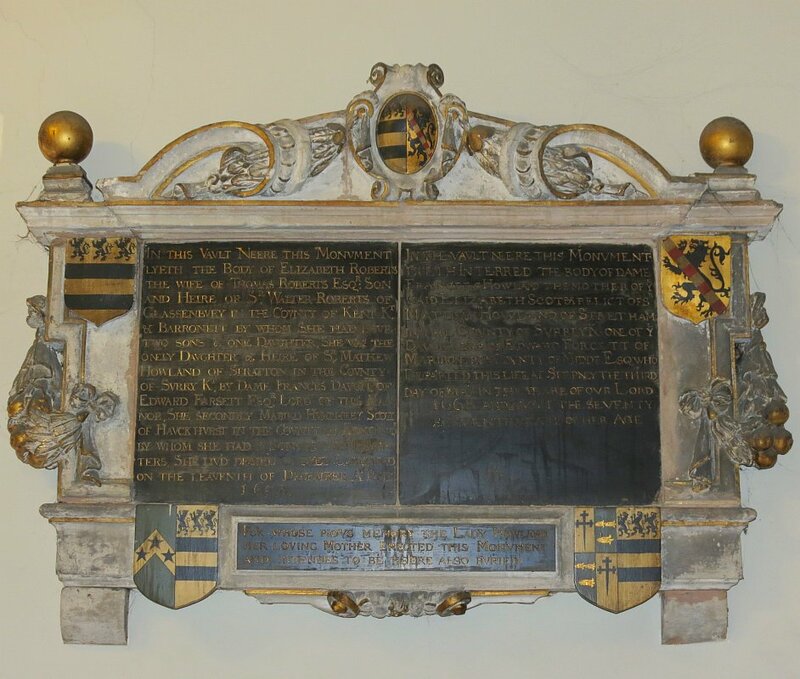 Hon John Beresford, and his daughter Anne Jane Beresford, d.1824 , a child. The inscription is on the base of a casket tomb shown end-on, bearing the shield of arms. It is ornamented with acroteria and has lion feet. There is a black backing to the upper portion of the monument. Another work by E. Physick of Park Terrace. J.C.F. Rossi's panel to Mary and Francis Swinney . 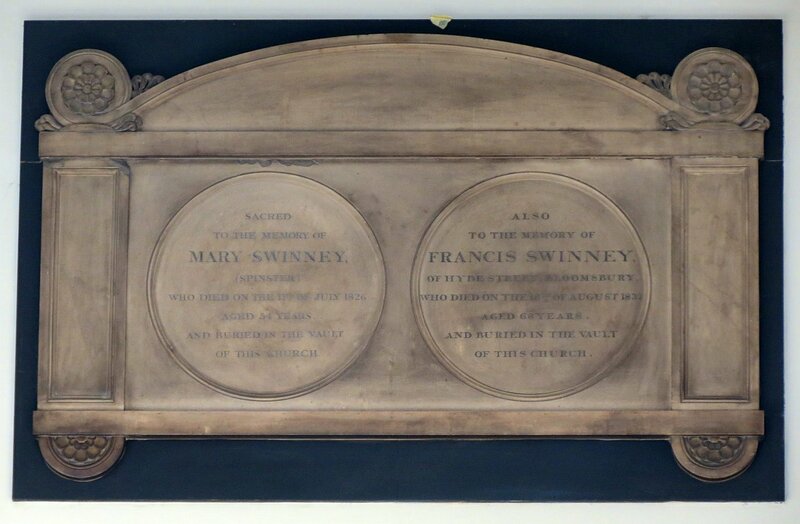 Mary Swinney, d.1826 , and Francis Swinney, d.1837 , a double panel with a pair of roundels commemorating the two Swinneys. This is within a rectangular surround, with side pilasters, an arched top with roundels above the pilasters to the sides with stylised carvings of flowers within them, and at the base, small rounded feet bearing half-flowers. All on a rectangular black backing, and signed by C. Rossi, RA – this is John Charles Felix Rossi RA – we might have hoped for something more sculptural from the man who made the caryatids of the Church we noted at the very top of this page. 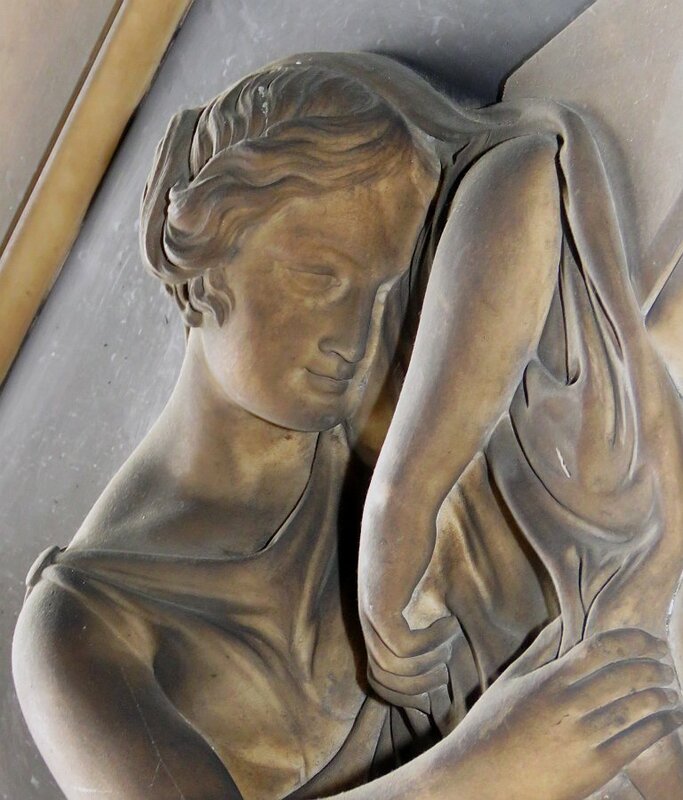 Edward Gaffin of Regent Street: carving to Henrietta Rivett Carnack . 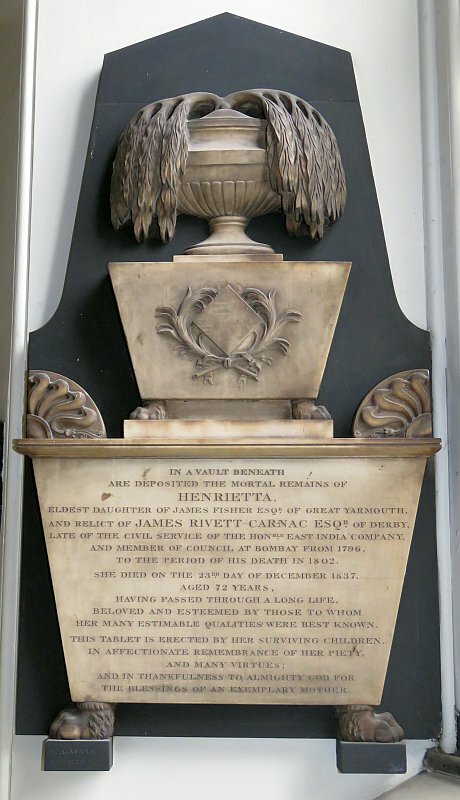 Henrietta Carnac, d.1837 , wife of James Rivett Carnac of Derby, ‘late of the Civil Service of the Honourable East India Company and Member of Council at Bombay’. The panel as a casket end, resting on lions feet, ears above, and bearing a smaller second lion-footed casket with a now blank coat of arms surrounded by crossed ferny branches. On top of that smaller casket is a Classical pot with a dying tree growing out of it, the leafy branches hanging down symmetrically on either side. 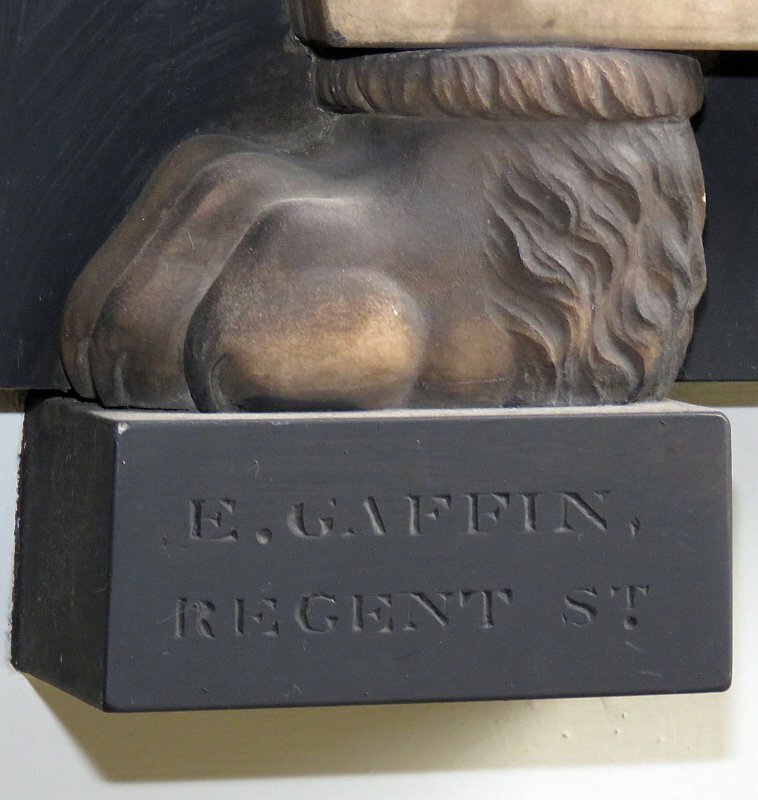 The whole on a black backing which rises to a short obelisk. . By E. Gaffin, Regent Street. The weeping tree is a rather fine example of the work of the most prolific firm of stone masons of them all (see this page). Vice-Admiral Sir John Tremayne Rodd, d.1838 . 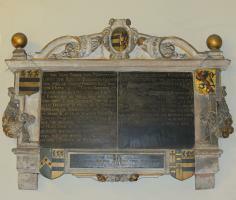 A rather grand panel, with the inscription forming the base of a tall monument with pediment on top, bearing a roundel bearing painted shields of arms, and a heavy carved drape falling down on one side. This partially covers a low relief carving of a choppy sea with the hulk of a ship upon it, bearing the name ‘Warrior’ – HMS Warrior was Rodd’s last ship, which in 1818 (the date is noted under the picture) was retired to become first a receiving ship for new conscripted sailors, and later a prison ship. The work is our last signed by Humphrey Hopper. 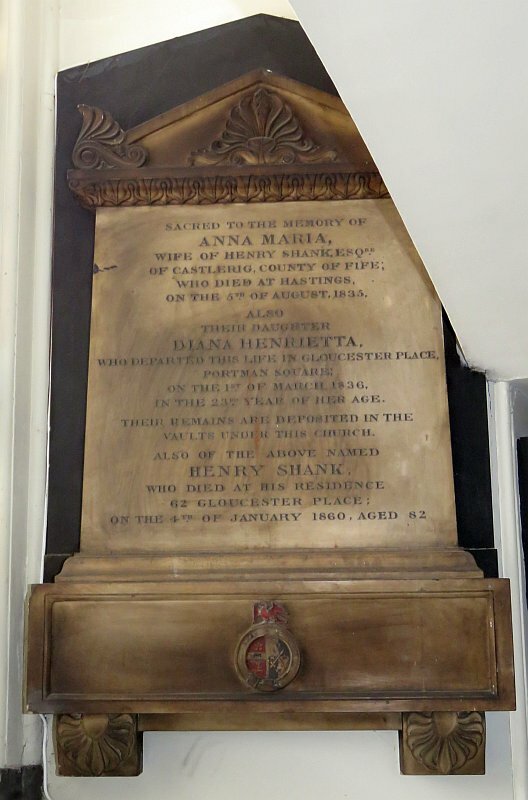 Captain Edward Pelham Brenton, d.1839 , and his wife Margaretta Diana Brenton, d.1843 , who had erected the monument. 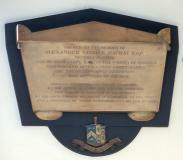 Brenton, the panel informs us, ‘became the historian of the naval services of Great Britain, and his energies were also devoted to the relief of his suffering fellow-creatures by the establishment of the Children’s Friend Society.’ Tall panel with a shelf on top of which rests a semi-draped pot, broad and decorated with feathery decorations. The carved drapes hang down at either side of the inscribed panel. There are two feet at the base, and the whole is on a black backing, shaped at the top to give a curvy backdrop to the pot, and with a depression at the bottom to allow for a small and finely carved shield of arms. It is signed by the prolific stonemason Denman, of 83 The Quadrant, Regent Street. John Morris, d.1840 , is also by E. Physick of Park Terrace. Classical panel with cut to chunky pediment shape at the top, a thick base, and block feet, and a thin black backing. Thomas Alexander Oakes, d.1840 , of the Madras Civil Service. Tall, blocky, Classical panel, styled as a portico, with upper blank pediment above a peristyle, side pilasters, and thick base. The ornament is on the latter, consisting of the coat of arms, and to the sides, relief carving of stylised flowers around a pair of almond shaped projections of the central field. Odd. There are fine little carved acroteria (‘ears’) on the pediment, and the whole has a narrow black surround to the upper part. There are two block supports at the base, one signed by the now very familiar E. Physick of Park Terrace, Regents Park. C.R. 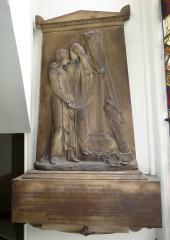 Smith of 37 Gloucester Place: Moreton-Dyer monument with figure sculpture . Henry Moreton-Dyer, d.1841 , with a eulogy. Tucked away where it cannot be seen from downstairs, the monument bears a carving of two female figures in front of a monument, this latter being no more than high relief, a tall plinth on which is the hidden form of a pot, covered in drapery which spills down the side of the plinth almost to the ground. Leaning against the plinth below this is a tied bunch of faggots, and a short axe, I think, and at the base lies a discarded pair of scales, for the one figure represents Justice abandoned, or rather the Injustice of the deceased’s passing. She stands holding one hand to her forehead, charmingly draped and with a sweep of drapery hanging from her raised arm, sweeping round in front of her to be held by the nearer figure, who we must presume is the young widow. This latter stands in three-quarters view, showing a nice line to haunch and leg. 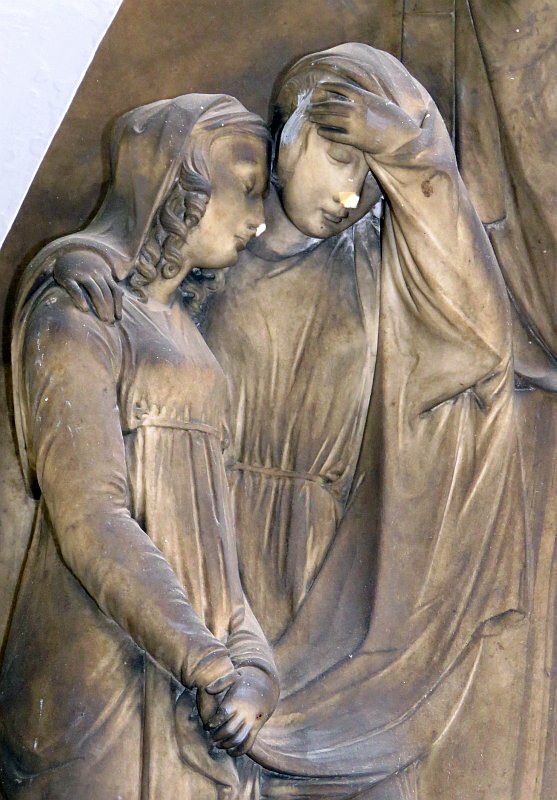 The pair of feminine figures, heads together, grieving, linked by Justice’s other hand on the bereaved girl’s shoulder, and she holding the curved drapery aforementioned, make a well composed group. Unfortunately the tips of their noses have been broken, leaving an uncomfortable whiteness, somewhat marring the mood of the piece. 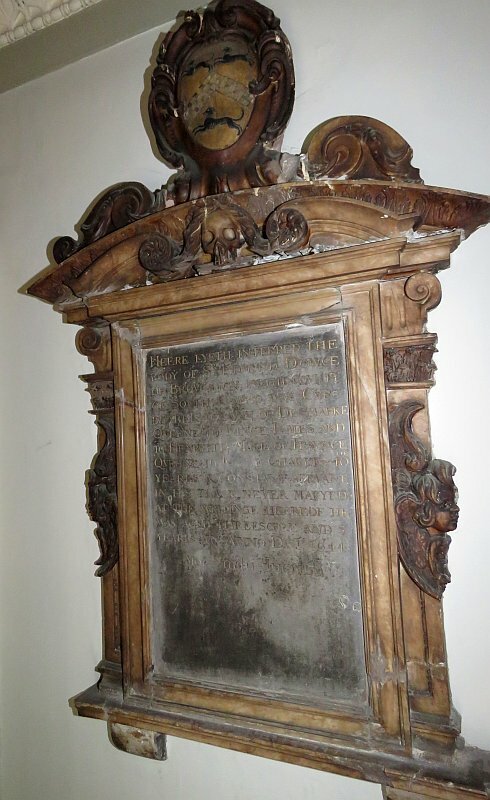 This fine piece of carving, with pedimented tomb shape behind, the inscription below, and then a shield of arms on a receding base with curly side pieces, is signed by the mason-sculptor C.R. Smith of 37 Gloucester Place. 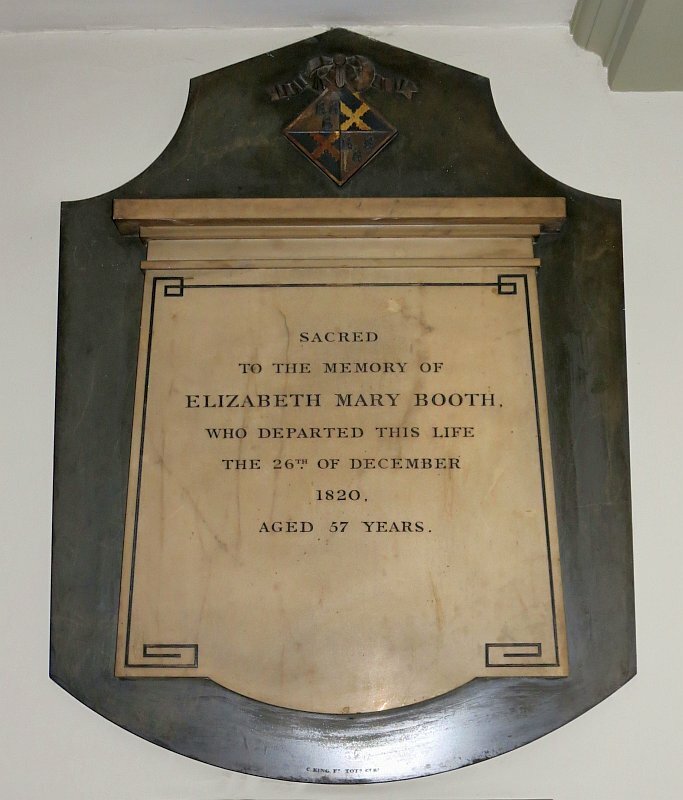 Fanny Elizabeth Carruthers, d.1845 , daughter of David Carruthers, noted above. 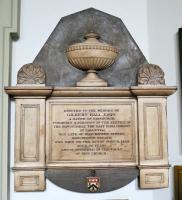 Casket-end monument, thus with the inscription on the side of the casket, which has outward sloping sides, an upper shelf or rim, and a pediment-like lid. 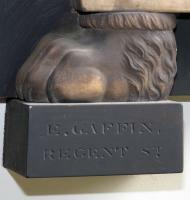 It rests on lion’s feet (the only carving on the monument) which stand on a thick shelf. All on a shaped black backing. Signed by the stonemason Tookey, not a familiar name. 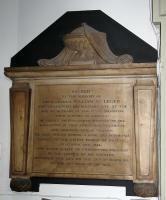 And on the stairway to upstairs, Samuel Letts, d.1906 , Scripture Reader in the Church for 50 years. A typical brass tablet, with a double border bearing a repeating pattern of inscribed leafy vine, and a raised centre, forming a vaguely Gothic arch, with a cross fleury in the centre. On a shaped marble backing, dark and variegated. Also on the stairway, a relief bronzy carving of the Last Supper . 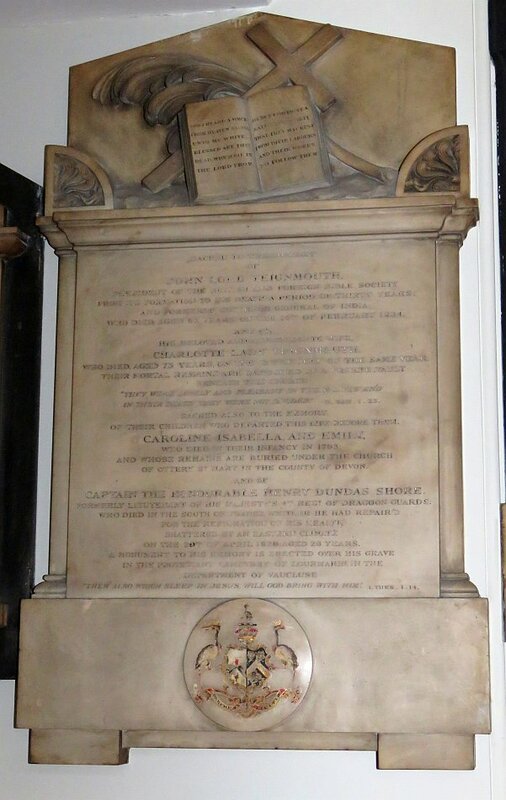 And we have missed three obscured panels behind the organ, to Sir Robert Dallas, d.1824 , and his wife, d.1847 ; a Captain Caldwell , and Stephen Cleasby, d.1844 , and his wife Mary , other details being hard to see in the narrow, dark space. All white-on-black tablets with minor carving. Moreton-Dyer monument: Justice's fallen scales . 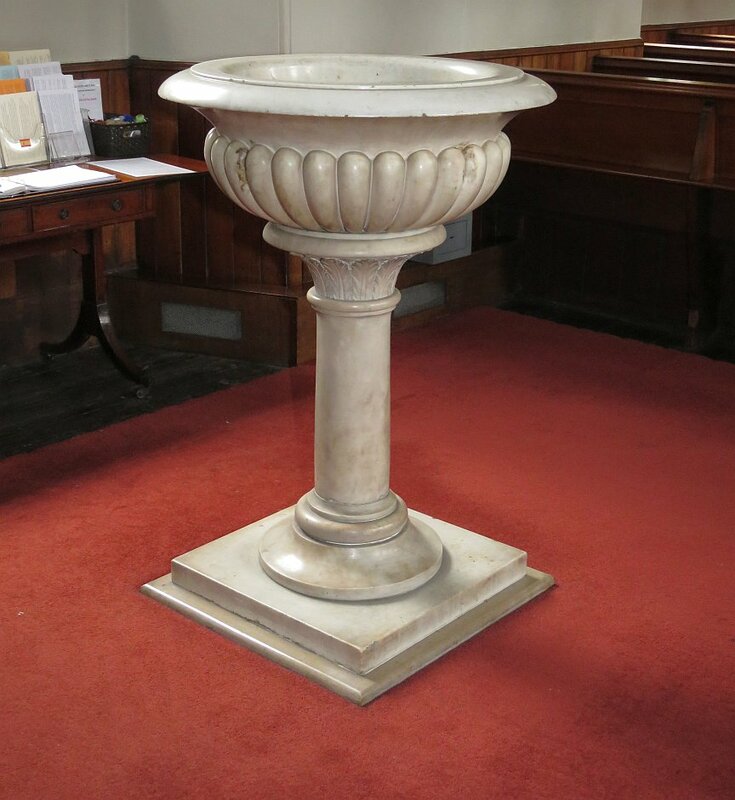 The font is an elegant, light piece, with round bowl, gadrooned (corrugated) on the outside, and with a thin shaft (picture below left). Early 19th Century. The interior was remodelled by Thomas Harris, architect and vestryman of the Church in the 1880s. 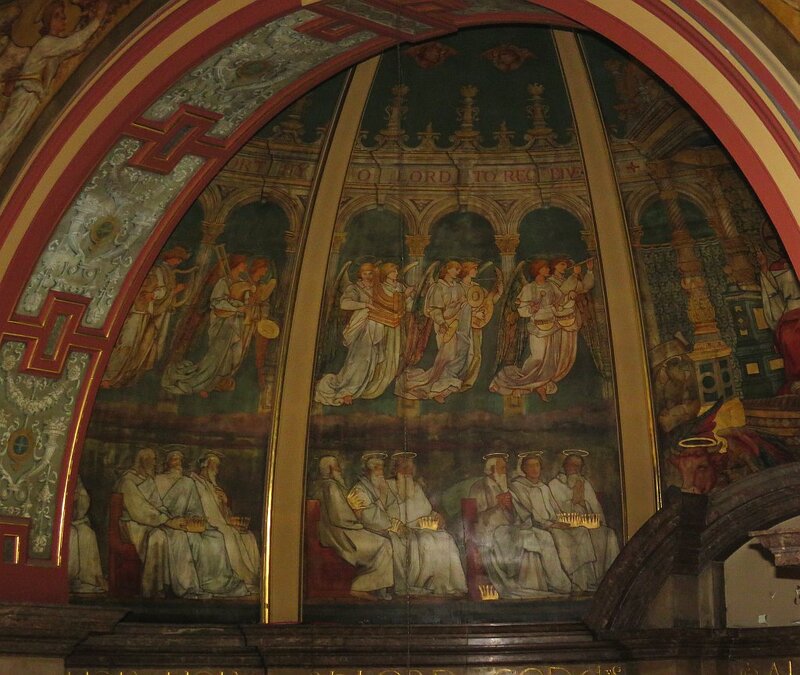 The outstanding feature of his work is the domed sanctuary and choir, highly coloured and with layers of painted angels (such as those below, centre - you will need to click to enlarge to see properly) and prophets, and a crucifixion in the centre. All very splendid, very Victorian. The decorations on the pillars and galleries date from the same refurbishment. 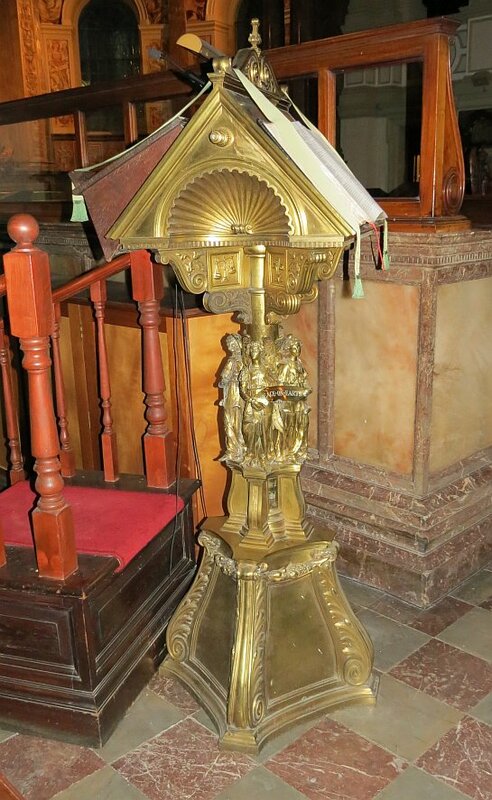 The brass lectern (above right) has small statues of angels clustered around the shaft, bearing an unrolling scroll labelled ‘Peace of Earth’. Late 19th Century, presumably from Harris’s remodelling of the interior. 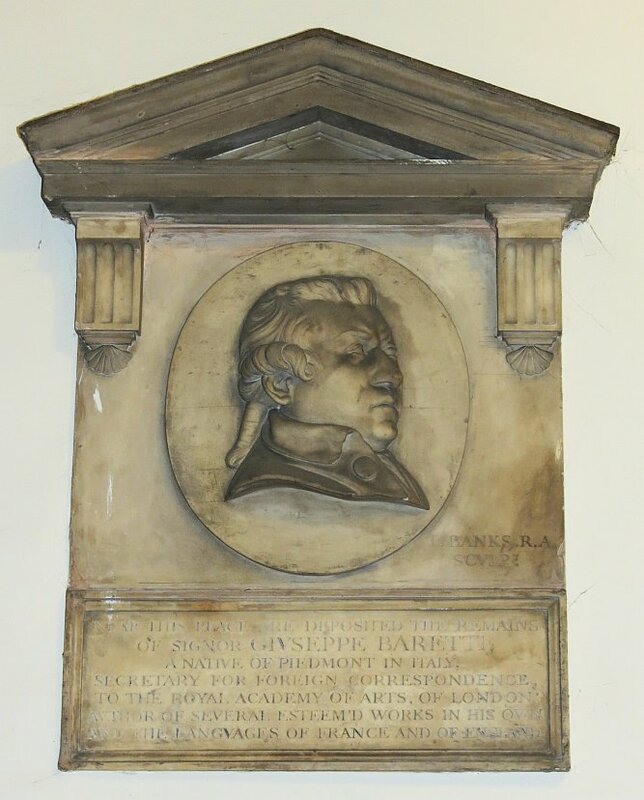 Of sculptural interest, we also note a 2007 portrait roundel in bronze to Charles Wesley , by Nicholas Dimbleby. 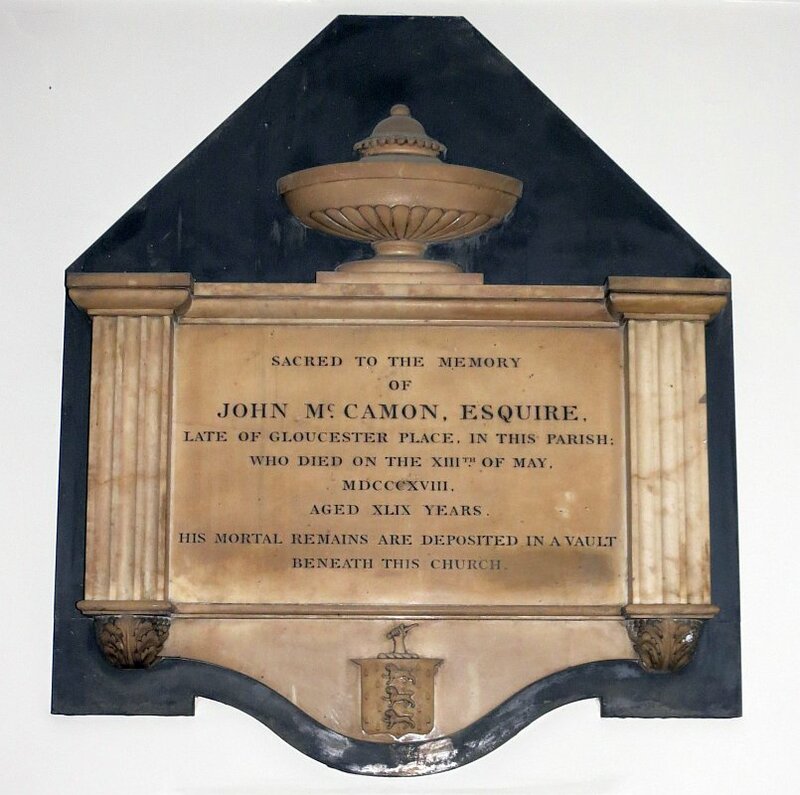 The accompanying plaque notes it was commissioned to mark the tercentenary since his birth; he was the co-founder of Methodism and is buried in the churchyard. With thanks to The Revd Canon Stephen Evans, Rector of Marylebone, for permission to use photos from inside the Church; the Church website is at http://www.stmarylebone.org/index.php.